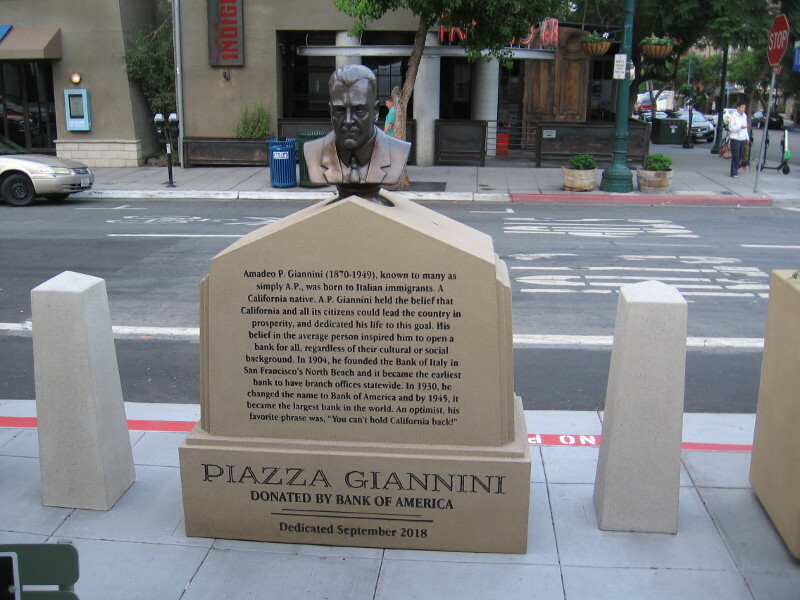 united states – Cool San Diego Sights! 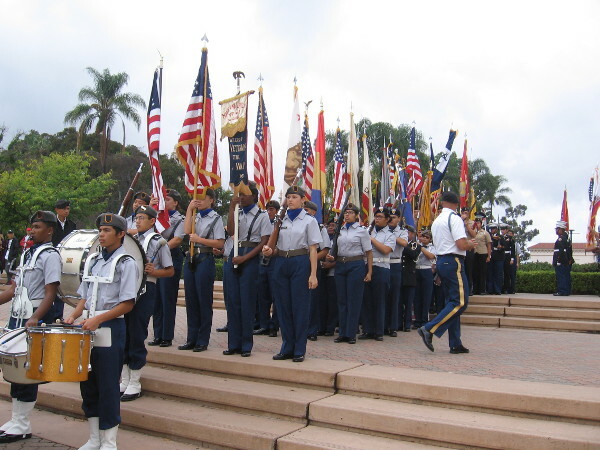 Bells of Peace ring on a special Veterans Day! 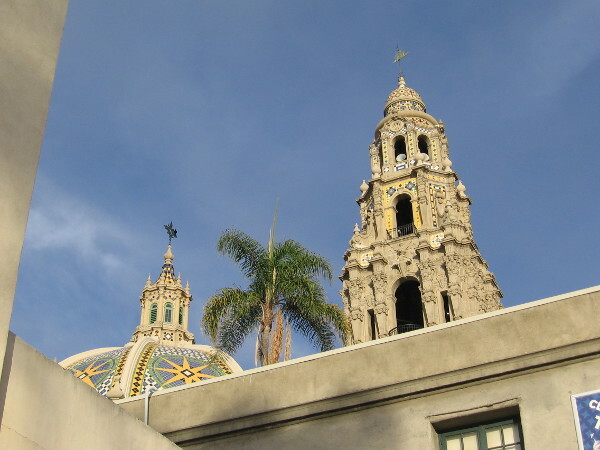 The historic California Tower rises into the blue sky above San Diego’s beautiful Balboa Park. 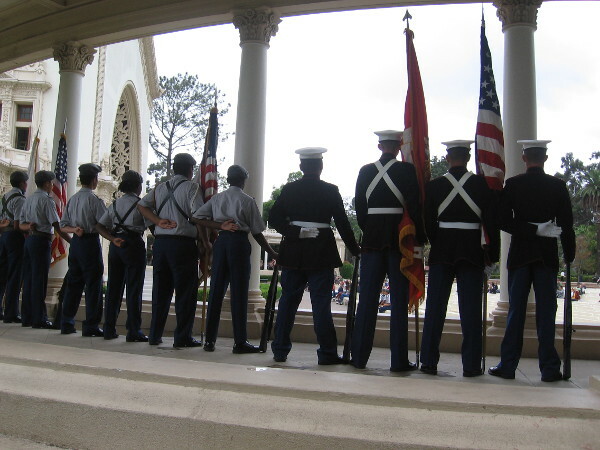 This morning, at 11:00 am, the carillon bells of Balboa Park’s iconic California Tower chimed twenty-one times. 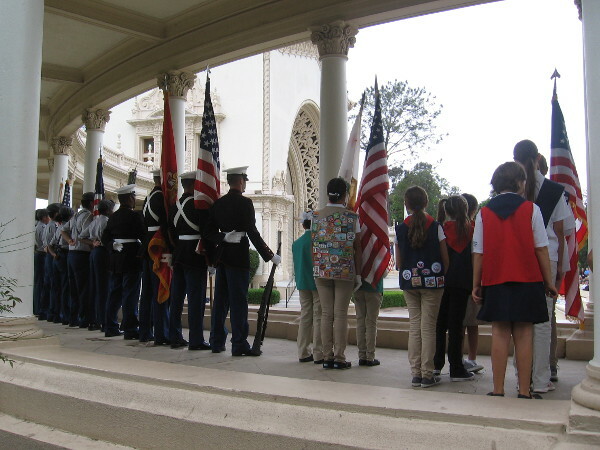 These symbolic Bells of Peace marked the centennial of Armistice Day. On the eleventh hour of the eleventh day of the eleventh month of 1918, exactly one hundred years ago, World War I finally came to an end. In the United States, Armistice Day became Veterans Day, a holiday that honors American veterans who’ve served their country in war and in peace. 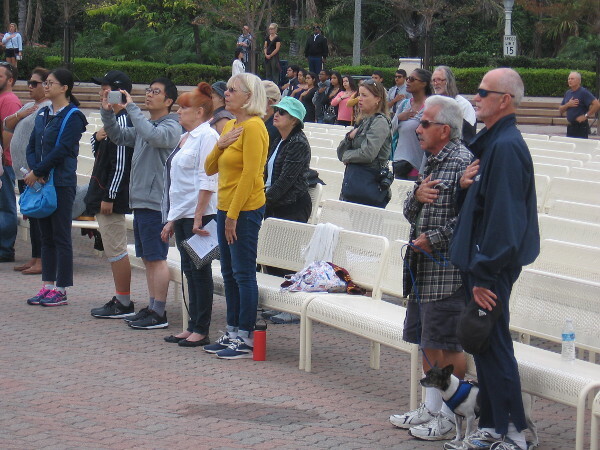 So this morning, when the clock struck eleven, on what might be called the 100th anniversary of Veterans Day, a special ceremony accompanied the ringing Bells of Peace. 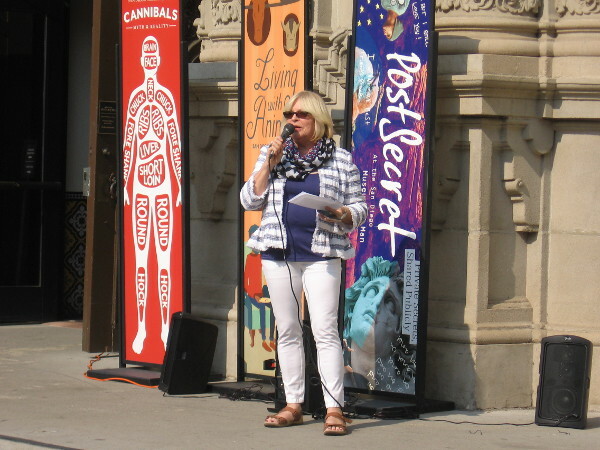 Flags were presented and voices lifted in front of the Museum of Man. 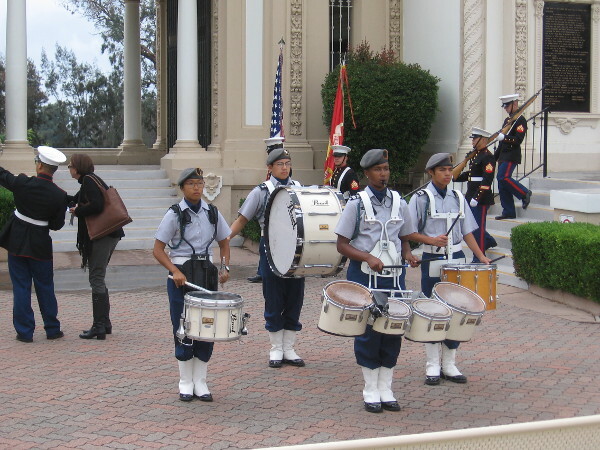 Bells of Peace rang out for the 100th Anniversary of Veterans Day! 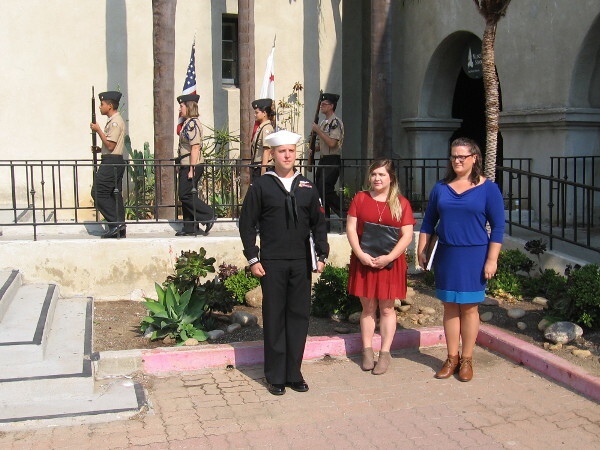 A special ceremony was held in front of the San Diego Museum of Man. 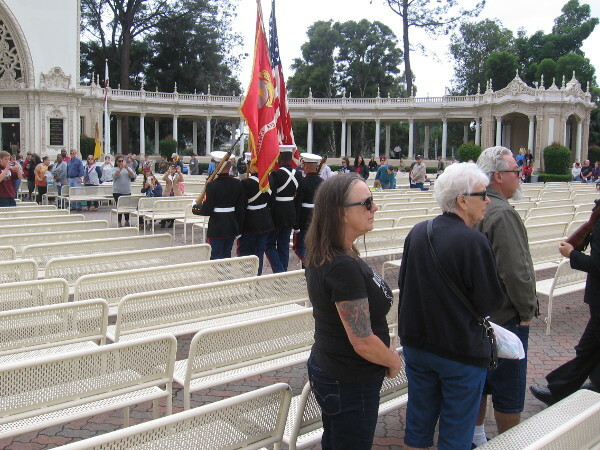 People gather for a symbolic, emotionally powerful event. 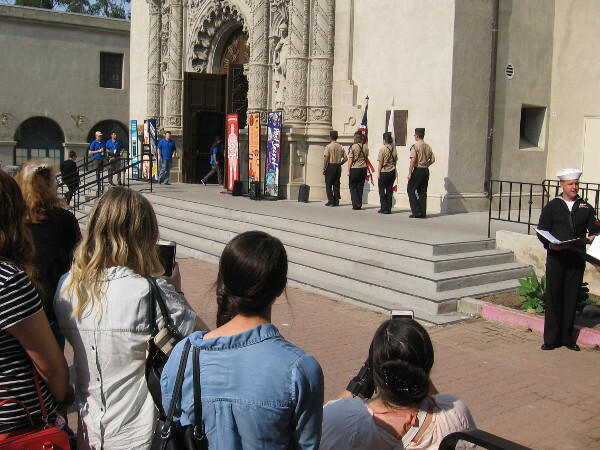 Gina Seashore, who plays the carillon inside the California Tower, addresses those who have gathered for the Veterans Day ceremony. 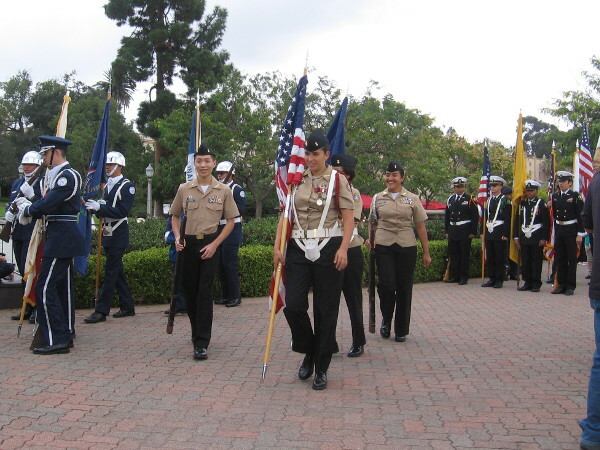 The patriotic Color Guard, from Ramona High School’s NJROTC, moves forward as the short ceremony begins. Flags advance to the front of the Museum of Man. 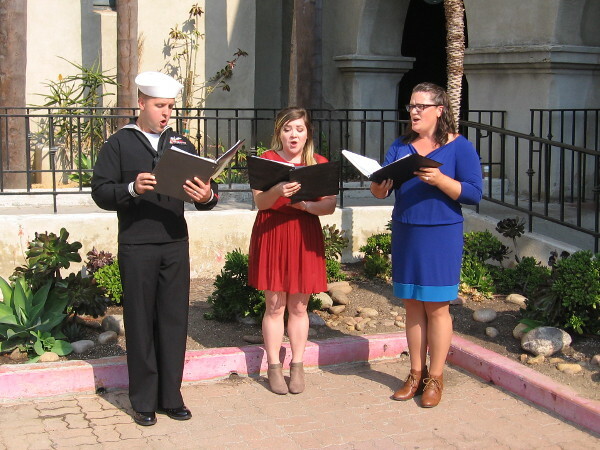 A trio sings the National Anthem. 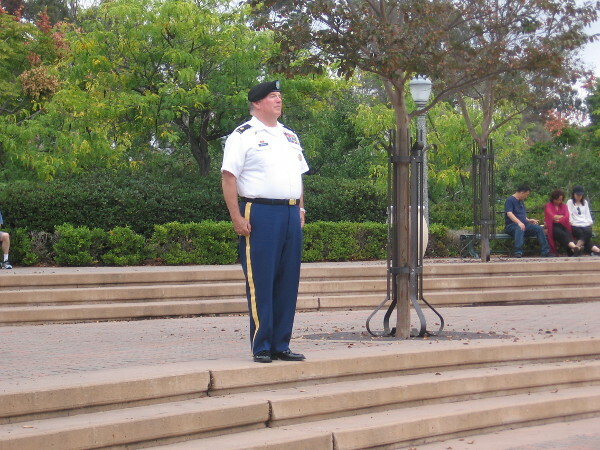 After the carillon bells ring twenty-one times, Taps is played. 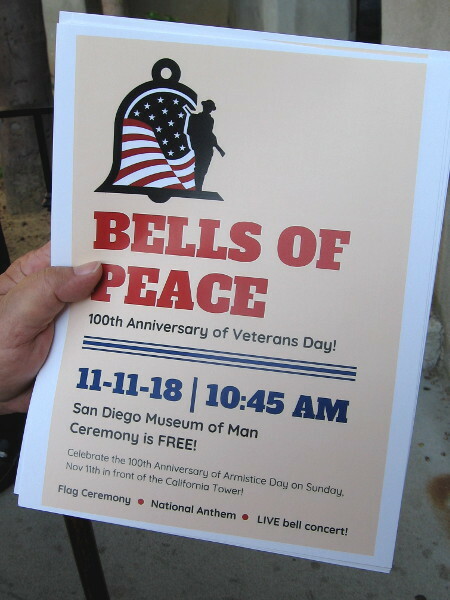 Posted on November 11, 2018 November 11, 2018 Tags balboa park, california tower, events, flag, military, museum of man, patriotism, peace, photography, san diego, united states, veterans, war, world war I1 Comment on Bells of Peace ring on a special Veterans Day! 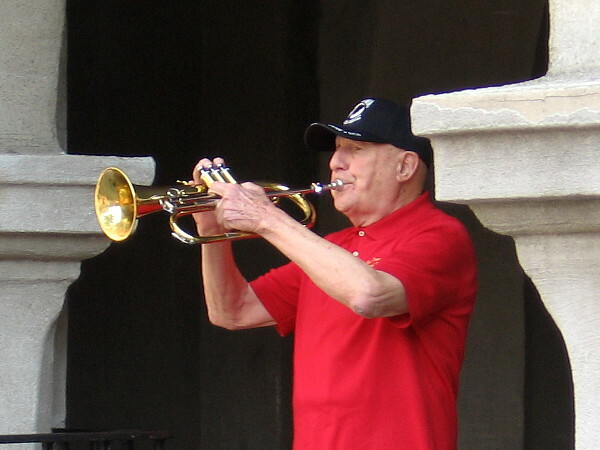 Remembering, helping Veterans this weekend. 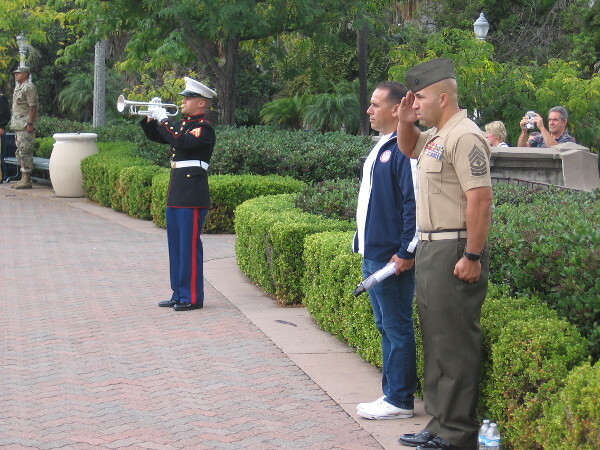 At events around San Diego County, ordinary citizens will honor heroes who’ve served our country. 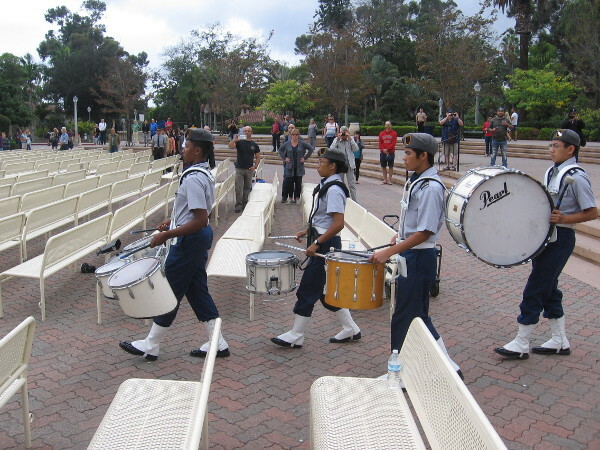 Flags will wave, bands will march, memories will be shared. 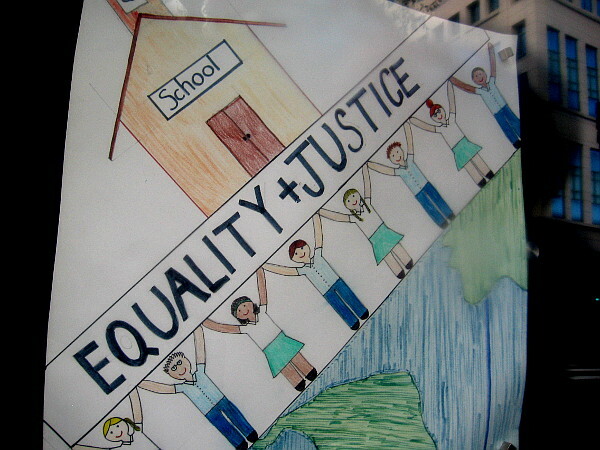 Handshakes will transmit gratitude. 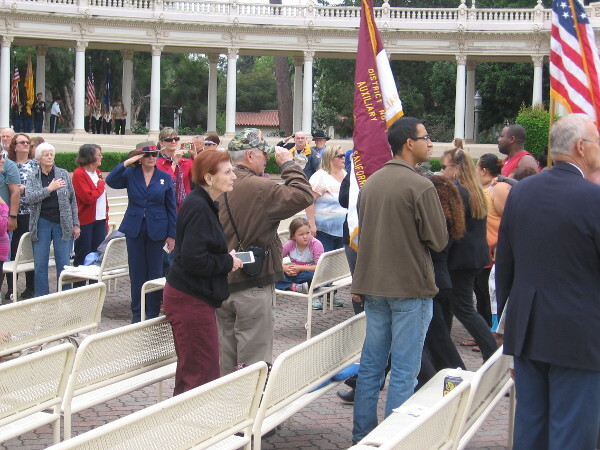 Over the years I’ve attended a variety of events that celebrate veterans. 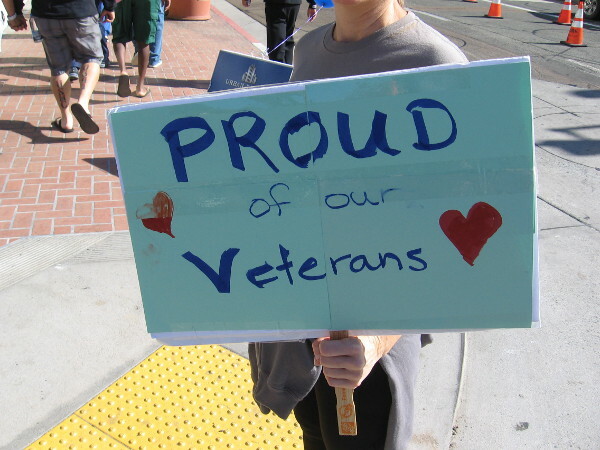 I’ve also learned of several ways to provide veterans with a little assistance. 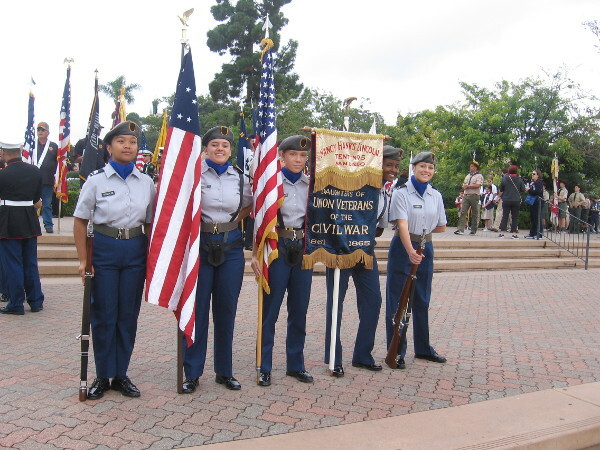 Photos of the San Diego Veterans Day Parade! 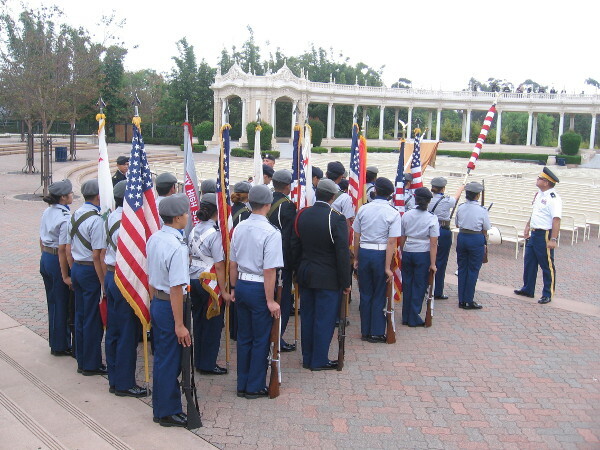 Veteran’s Day celebrated in Balboa Park. 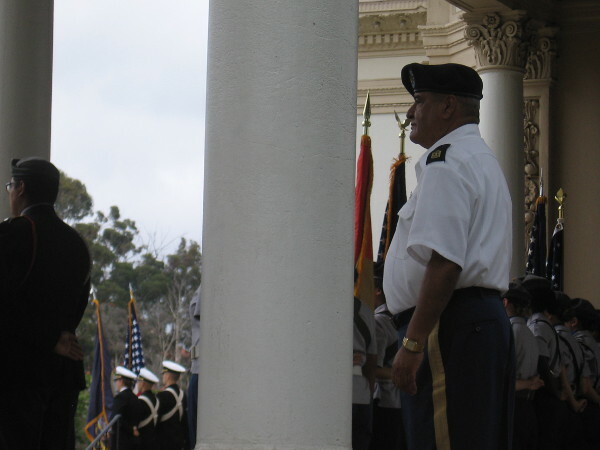 World War II vets honored on USS Midway. 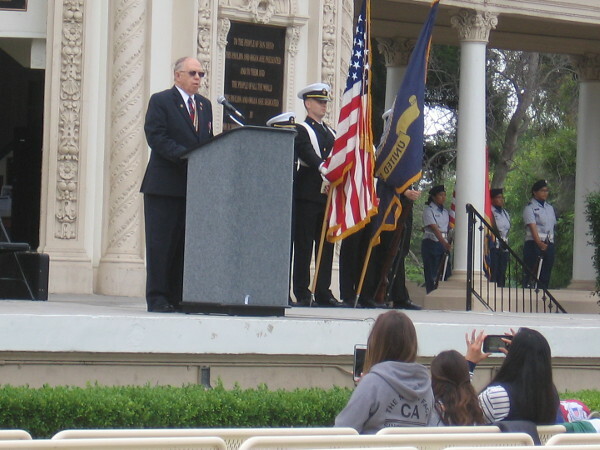 World War II vets honored at Spirit of ’45 event. 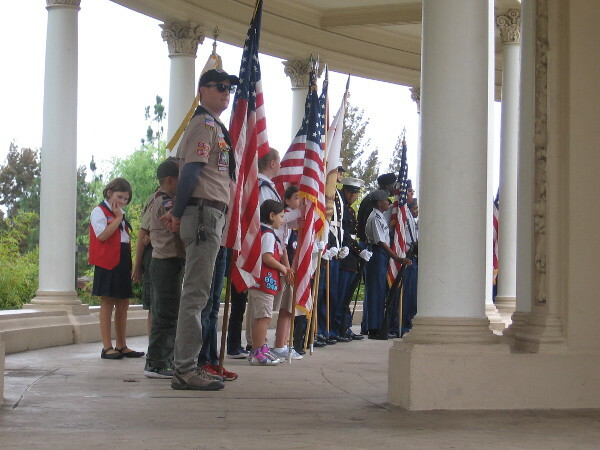 American heroes honored at Veterans Museum. Heroes of Mt. 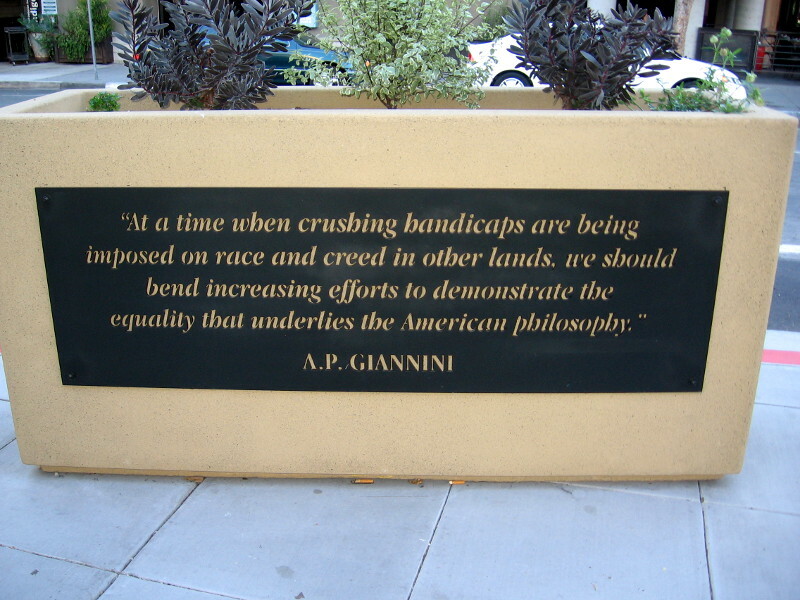 Soledad National Veterans Memorial. 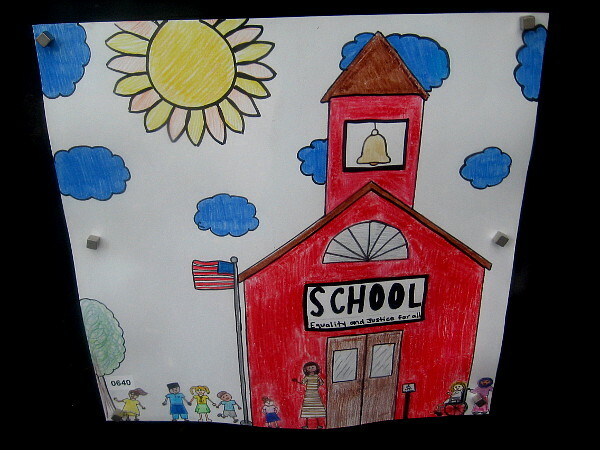 Helping veterans heal through creative art. 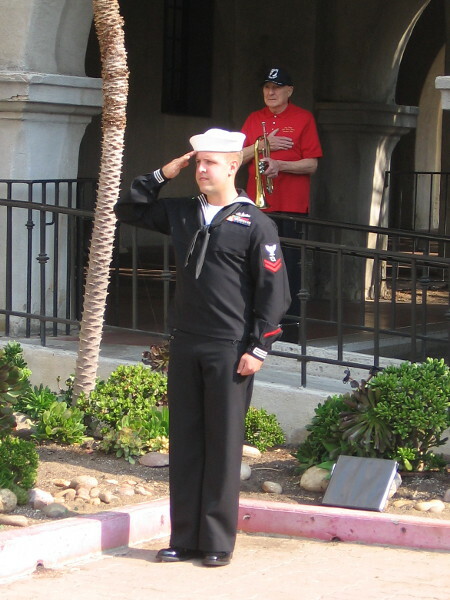 How to get support from fellow Veterans in San Diego. Horse therapy helps veterans recover from trauma. 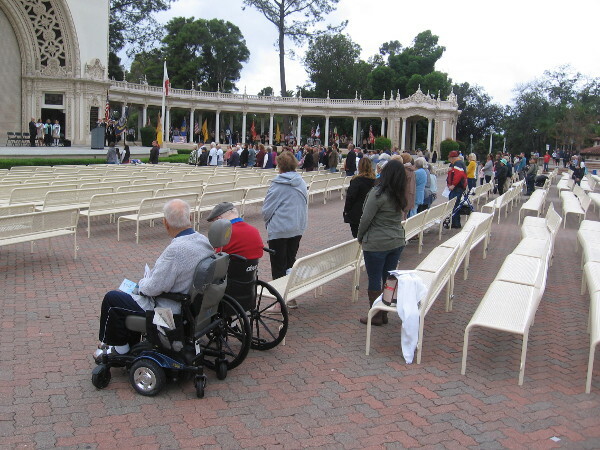 Posted on November 7, 2018 November 8, 2018 Tags charity, events, flag, greatest generation, heroes, midway, military, parades, patriotism, people, united states, veterans, war, world war II1 Comment on Remembering, helping Veterans this weekend. 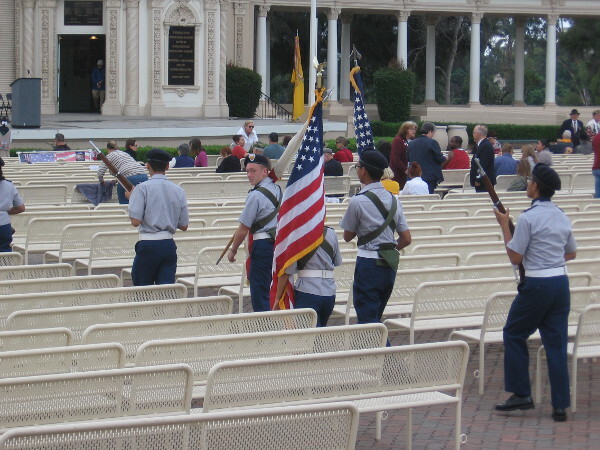 Photos of Massing of the Colors in San Diego. 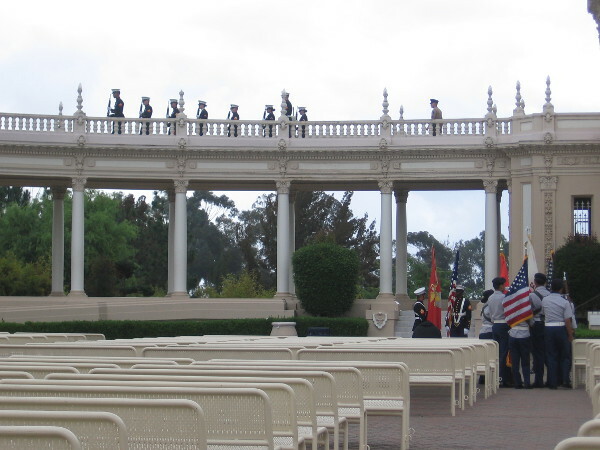 The 62nd Annual Massing of the Colors and Service of Remembrance was held this morning at the Spreckels Organ Pavilion in Balboa Park. 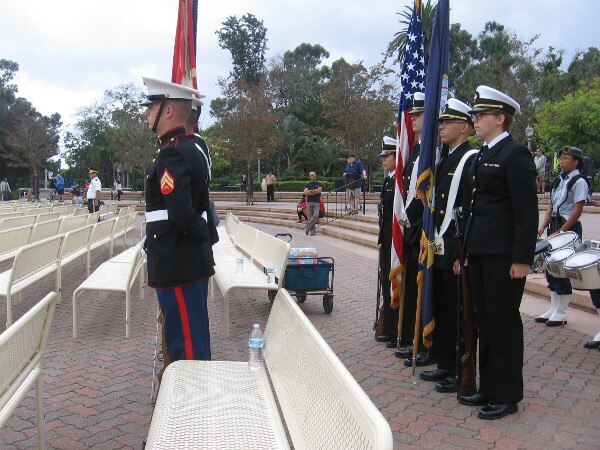 The stirring, patriotic event is organized by the San Diego Chapter of The Military of the World Wars. 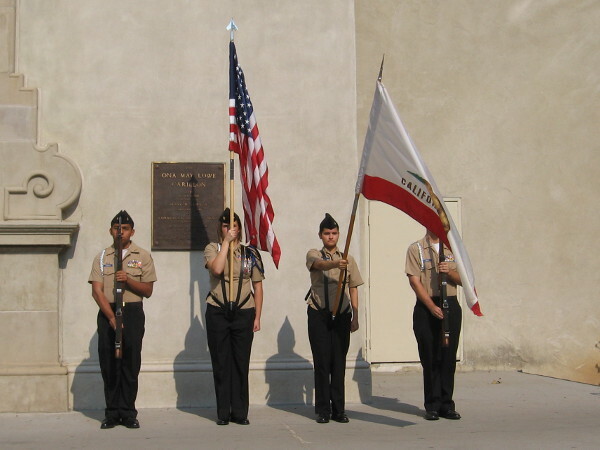 Its purpose is to honor the flag and support and remember those who have served our country and defended liberty, including those who paid the ultimate sacrifice. 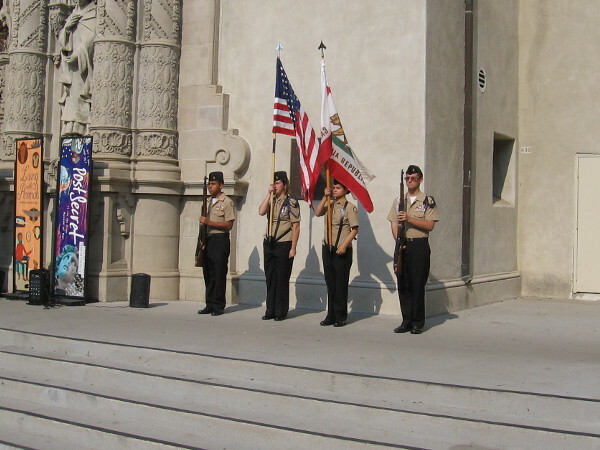 The parade of color guards this year included about 30 groups, from a variety of local organizations representing ordinary Americans, the military, veterans, law enforcement, JROTC and ROTC, and scouting. 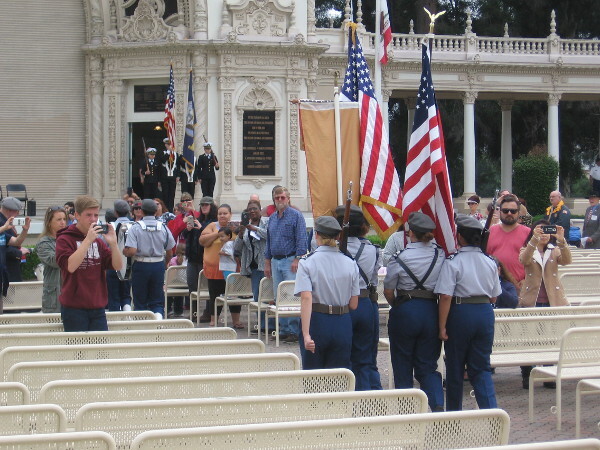 The annual Massing of the Colors has been held at the Spreckels Organ Pavilion for 62 years without interruption. 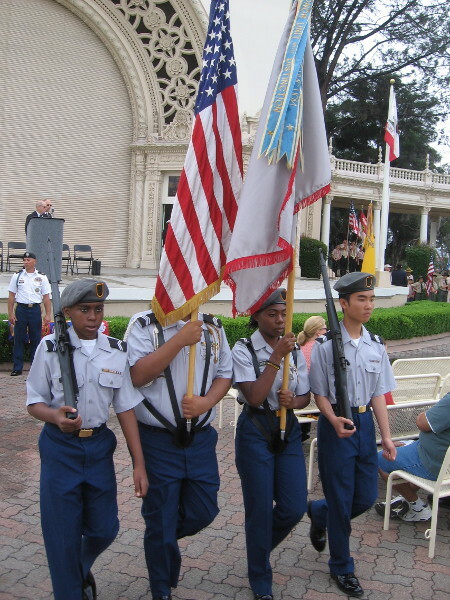 During a speech, special recognition was given to the Daughters of the American Revolution, who have faithfully participated in this patriotic celebration every single year. 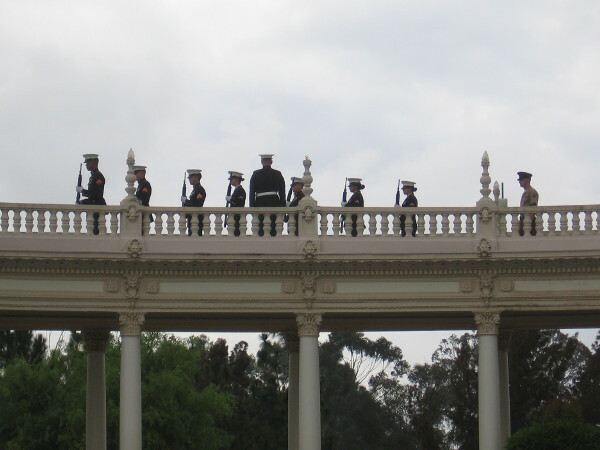 When I arrived at the Spreckels Organ Pavilion, a practice run was just finishing up. 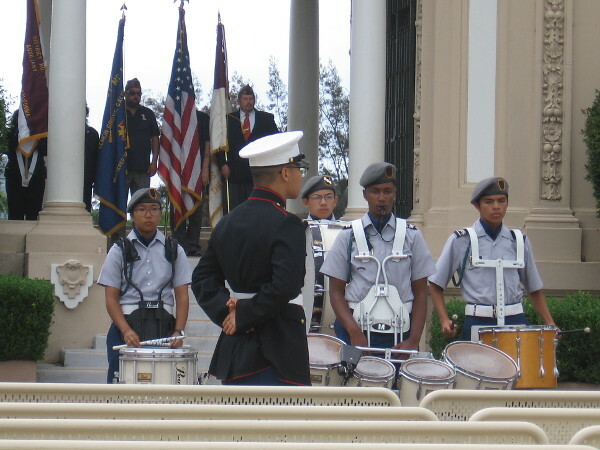 After a short wait, the parade of color guards commenced. I will let my photographs tell the story. 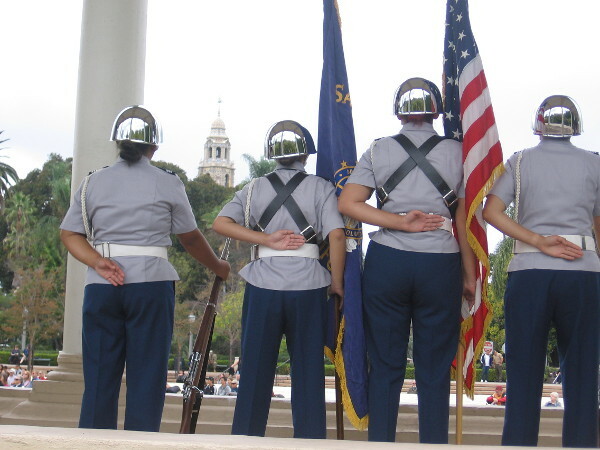 Posted on October 13, 2018 October 13, 2018 Tags americana, balboa park, flag, law enforcement, liberty, military, parades, patriotism, photography, san diego, scouts, spreckels organ, united states, warLeave a comment on Photos of Massing of the Colors in San Diego. 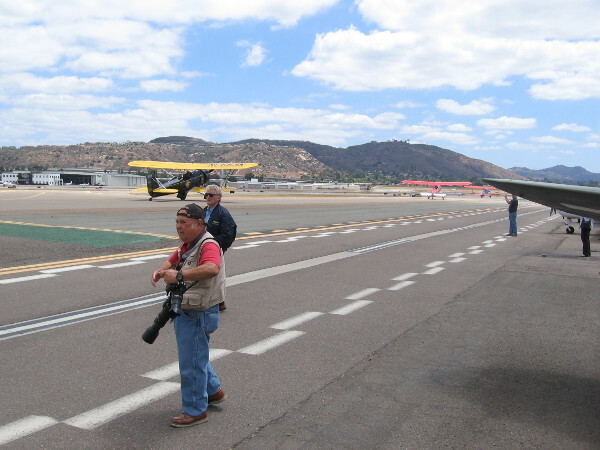 Photos of historic centennial U.S. Air Mail flight! 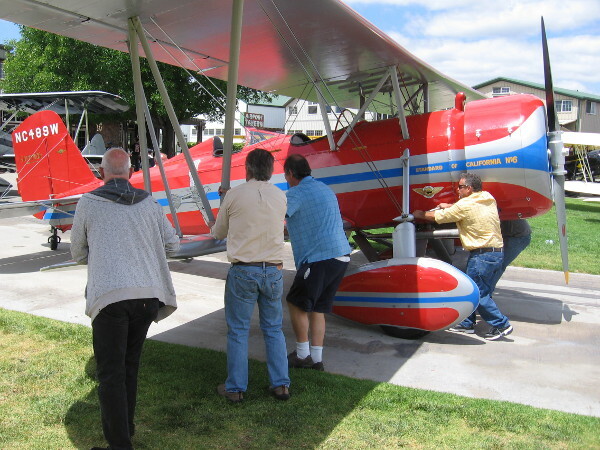 A vintage biplane is almost ready to embark on an historic flight. Today I witnessed a bit of history. 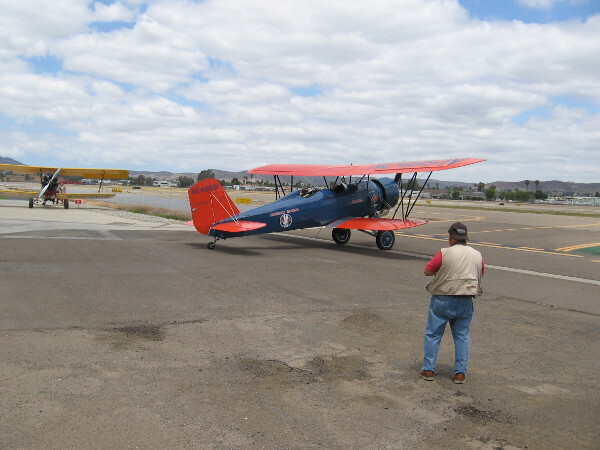 I headed to the Allen Airways Flying Museum at Gillespie Field to watch three vintage Stearman Speedmail biplanes take off on the first leg of the old Contract Air Mail 8 (CAM 8) route. 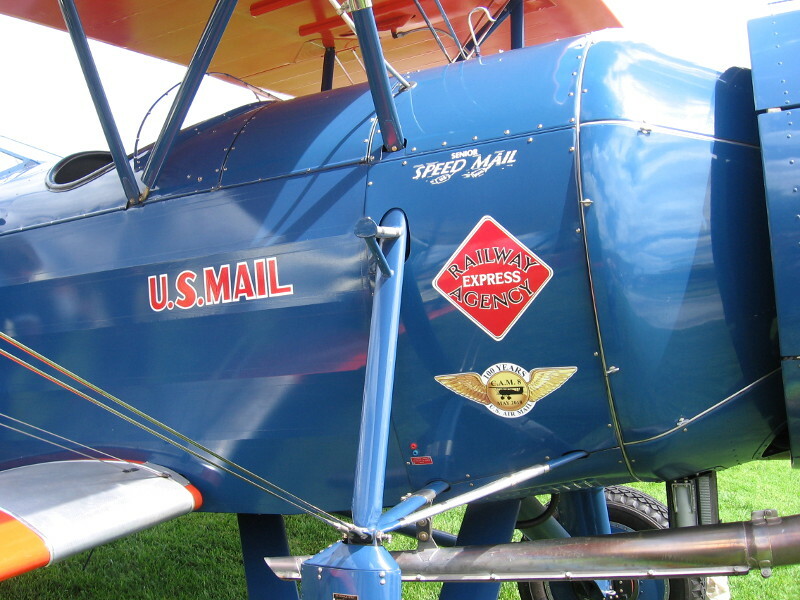 The very special six-day event marks the centennial of United States Air Mail service, which began on May 15,1918 with a flight from Washington D.C. to New York. Today’s flight, endorsed by the U.S. Postal Service, was the beginning of a 1200 mile journey up the West Coast that will include 12 stops, finally ending at Paine Field in Everett, Washington. 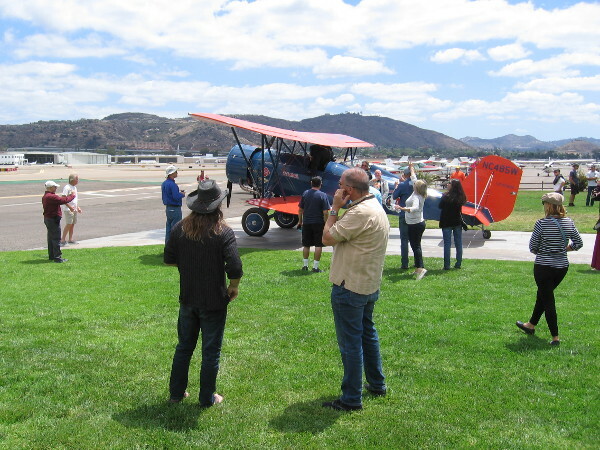 Many hobbyists, pilots and history enthusiasts were on hand to see the trio of vintage biplanes begin their commemorative flight. 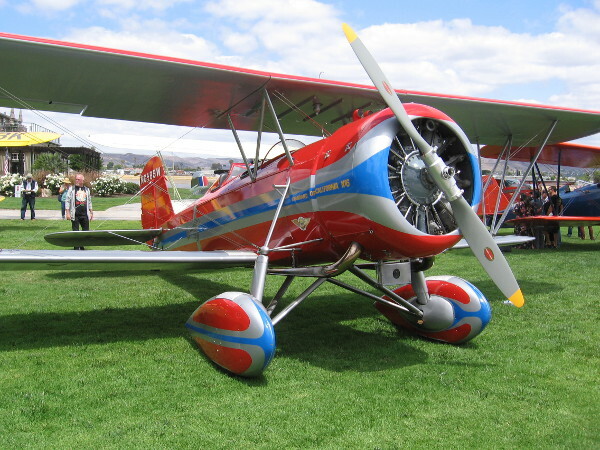 I read that only seven Stearman Speedmail airplanes survive today; 41 were originally built to transport the U.S. Mail by air. As the planes taxied down the runway for takeoff, a friendly gentleman provided me with a little more history. I learned the original CAM 8 route up the West Coast took about two days, depending on the weather and the wind. 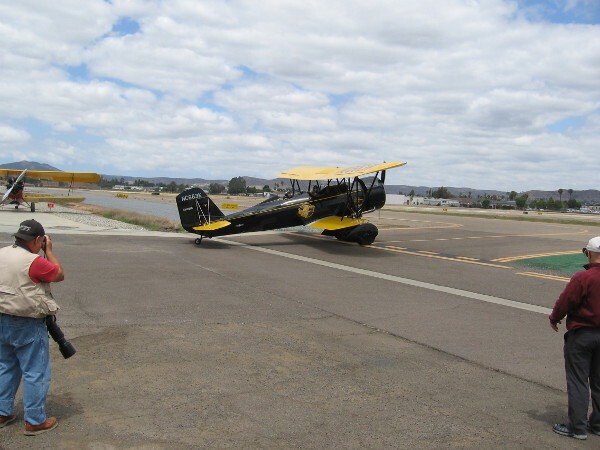 He explained how the highly dependable Stearman Speedmail planes have a powerful 450-horsepower engine, and we observed how they took to the air very quickly. In the early days of aviation, before modern airports with lengthy runways, this was a requirement. I also learned that many other owners of vintage aircraft flew in for today’s event, parking their colorful planes outside the Allen Airways Flying Museum. The museum itself is home to a variety of cool, historical aircraft, and welcomes visitors by appointment. 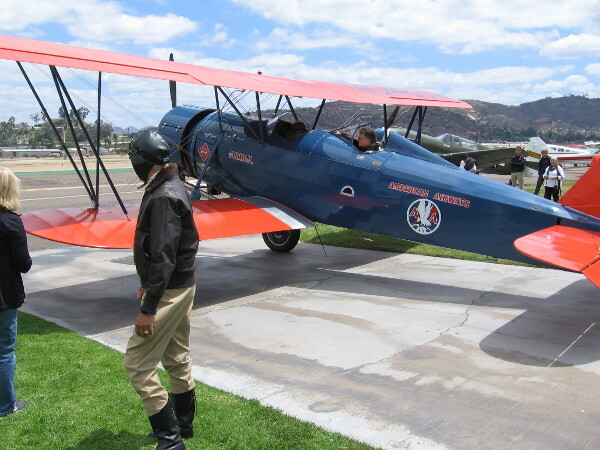 One of three Stearman Speedmail biplanes which will fly from San Diego to Seattle to commemorate the centennial of U.S. Air Mail service. 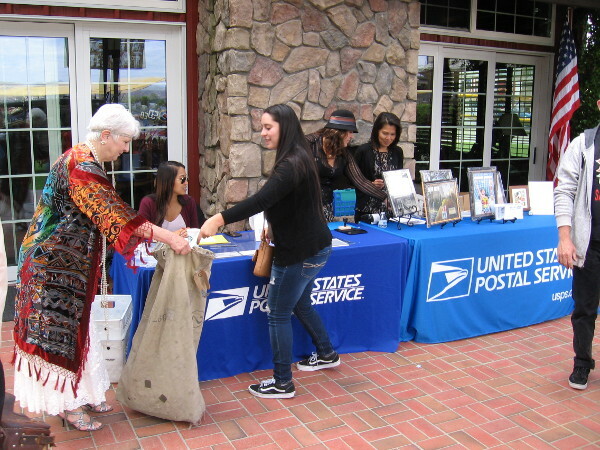 Special mail collected at a USPS table is put into a canvas airmail bag. 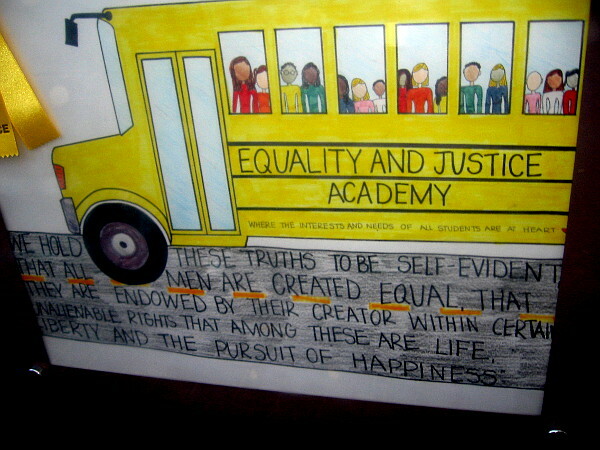 Each piece will be postmarked at the 12 stops along the 1200 mile flight. 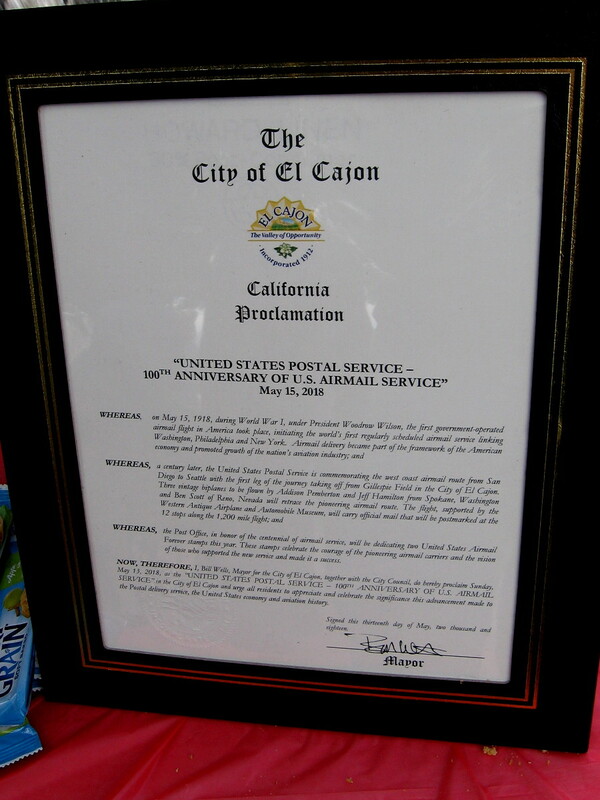 The City of El Cajon issued a proclamation to mark the 100th Anniversary of U.S. Airmail Service. 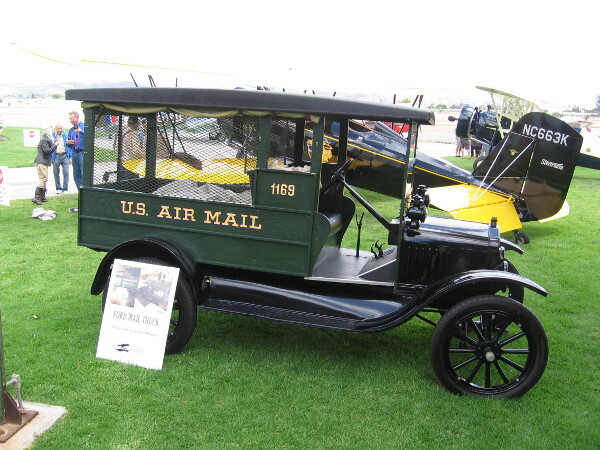 A vintage Ford U.S. Air Mail truck was on display during the event, courtesy of the San Diego Air and Space Museum. 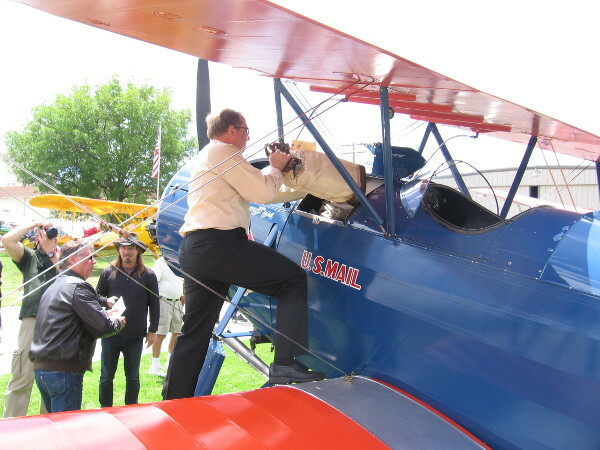 Loading a sack of official U.S. Mail into the front of one Stearman Speedmail biplane. Another plane participating in the event waits nearby. People roll the biplane off the grass so that it can taxi away from the Allen Airways Flying Museum. These two planes are ready to safely head out onto the Gillespie Field runway. 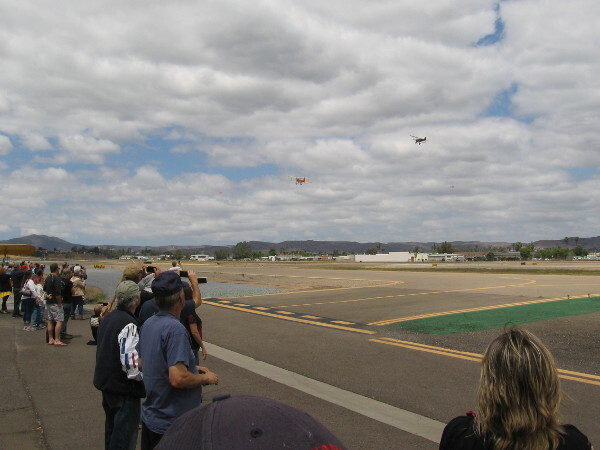 It’s almost 11:45, the time the three planes will start their U.S. Air Mail centennial celebration flight. 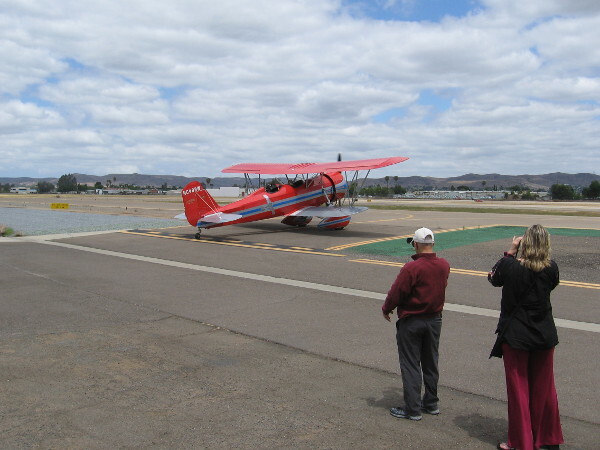 The first Stearman Speedmail biplane taxis out onto the runway. It slowly heads down the runway to prepare for takeoff. 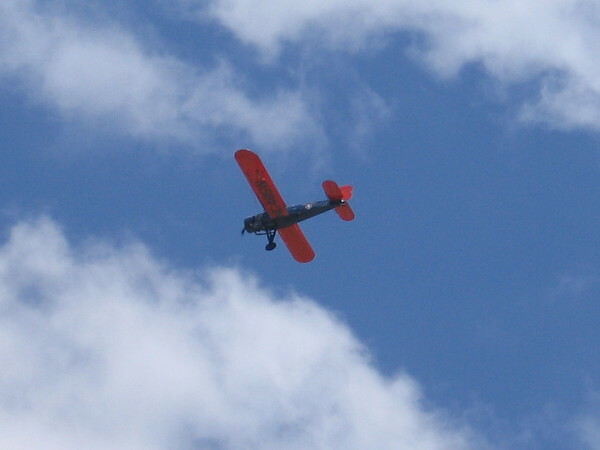 The second Stearman Speedmail aircraft follows. And here comes the third. An historic flight will soon begin! 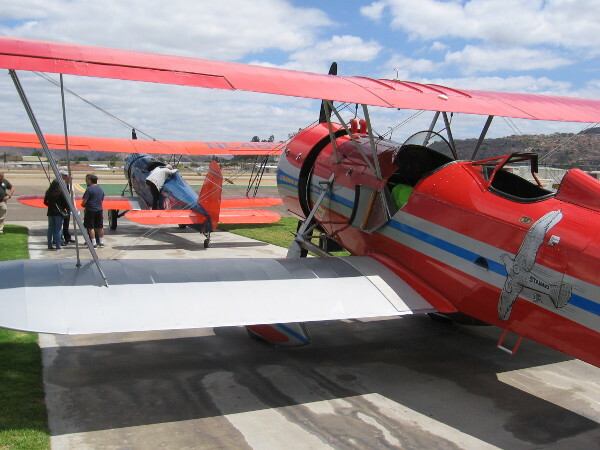 The trio of vintage biplanes heads down to the end of the airport’s runway. 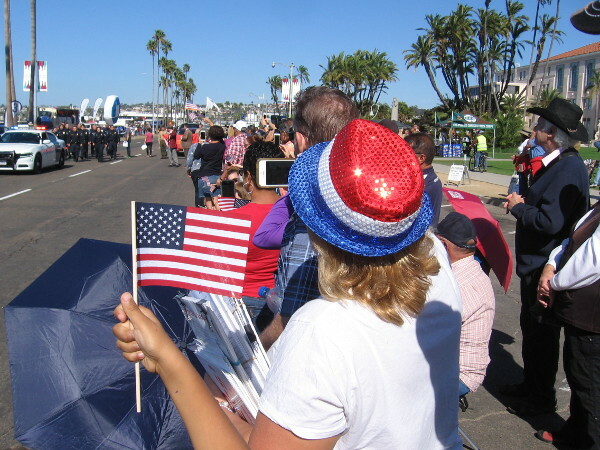 People watch as the Air Mail centennial celebration flight begins in San Diego! 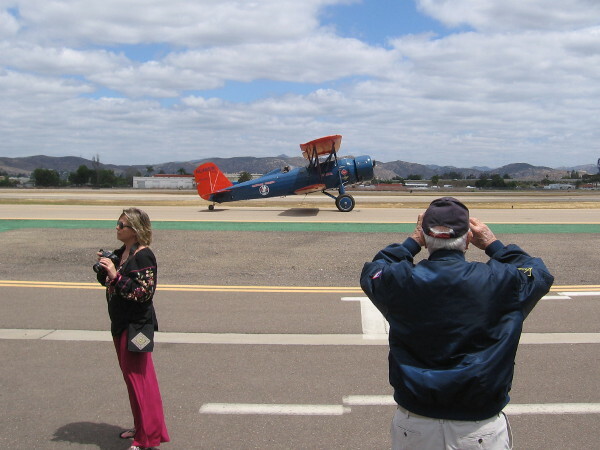 A vintage biplane flies north, beginning a 12-stop 1200-mile flight that retraces the Contract Mail 8 (CAM 8) air mail route. 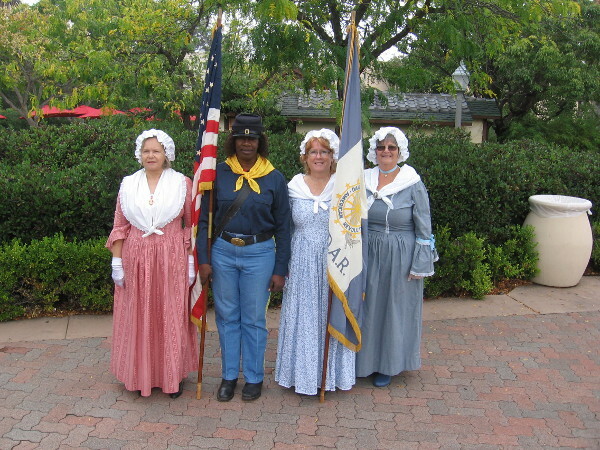 Today many enjoyed a fun celebration of American history at Gillespie Field in El Cajon! 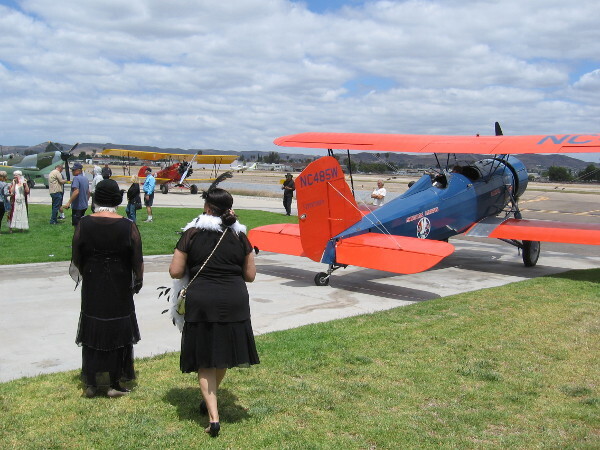 Posted on May 13, 2018 May 13, 2018 Tags airplanes, americana, aviation, cool, el cajon, events, fun, history, museums, nostalgia, photography, postal service, san diego, united statesLeave a comment on Photos of historic centennial U.S. Air Mail flight! 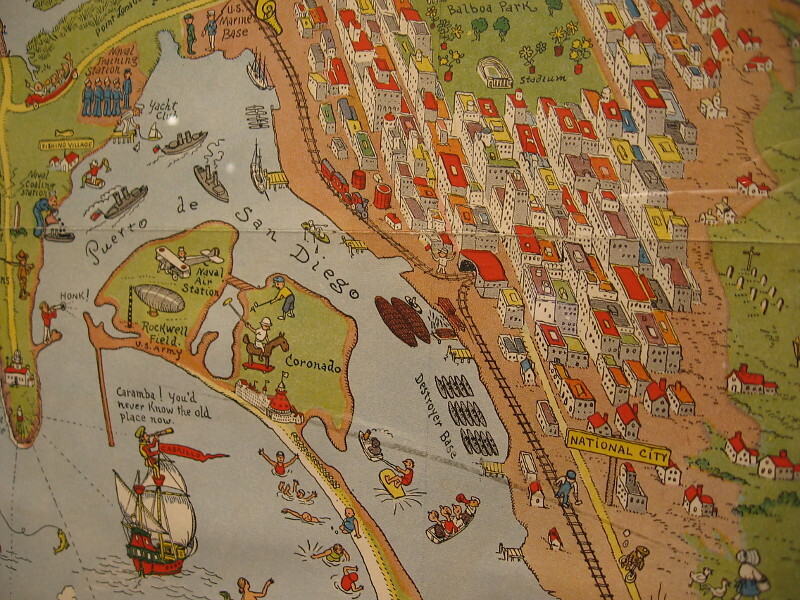 Visit a world-class map museum in La Jolla! 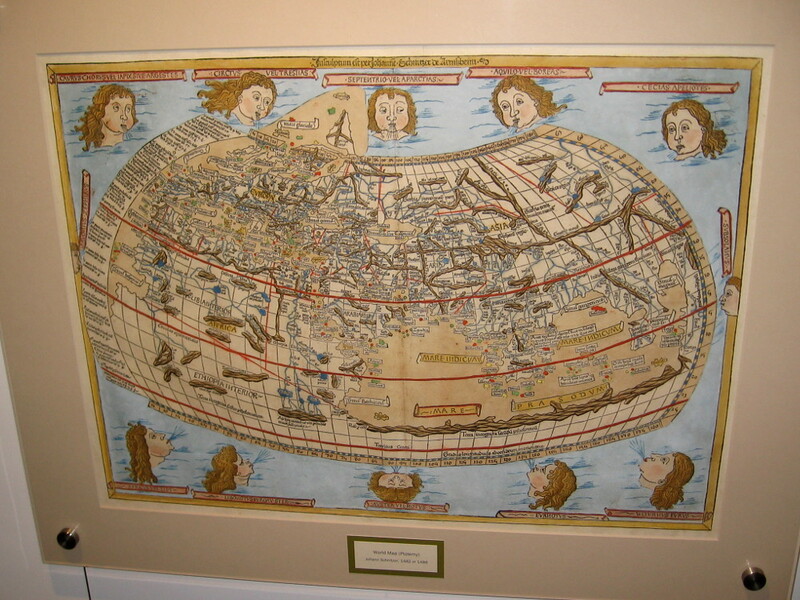 World Map (Ptolemy), Johann Schnitzer, 1482 or 1486. 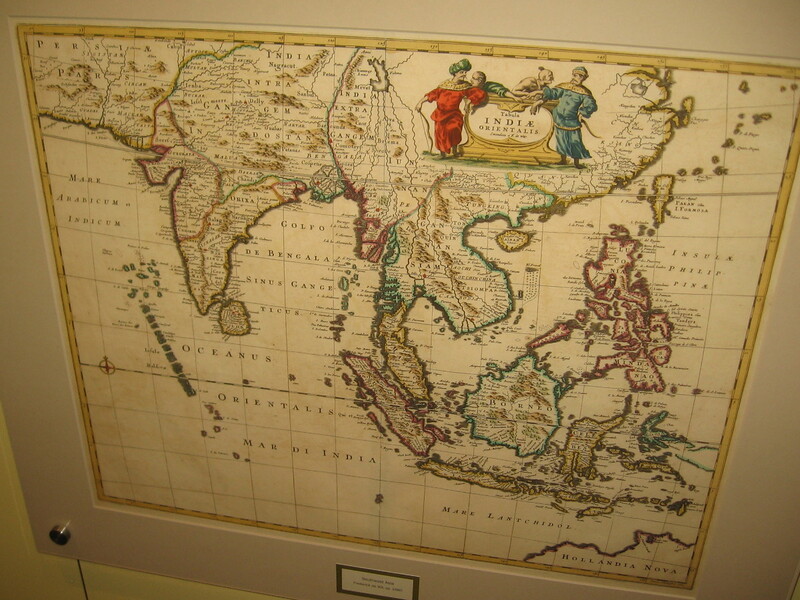 I was surprised to learn recently that a world-class map museum is located in San Diego. 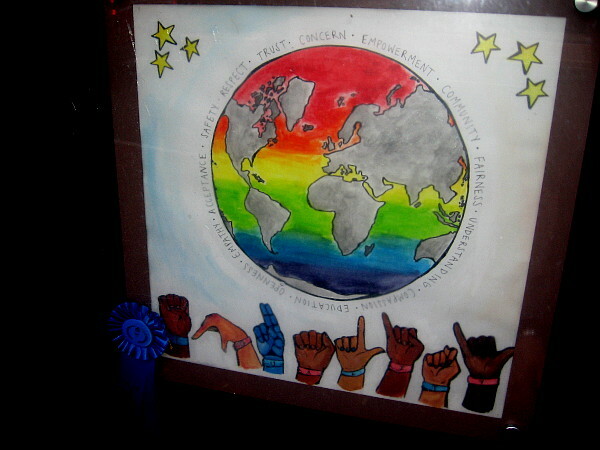 The Map and Atlas Museum of La Jolla is considered to be one of the best dedicated map museums in the entire world! Out of curiosity, I swung by the small museum yesterday and lingered for at least an hour. I could have spent the entire day looking at the amazing collection of historical maps that fill several themed galleries. Many of the rare maps are antique, dating from centuries ago when the world’s outlines were unknown, and sea monsters inhabited the watery margins. Every map in the collection is original and authentic, including the first map ever printed! As I stepped through the door I was greeted by Richard, the friendly director of the museum. 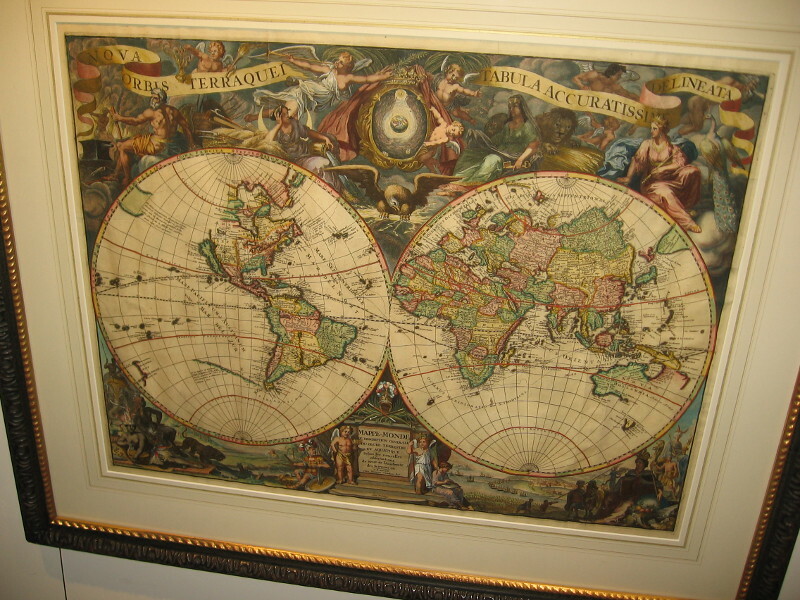 I learned that this free museum was founded by Michael Stone, a local businessman and collector with a love for maps. In his youth he collected baseball cards, stamps and coins, before maps and cartography became his passion. 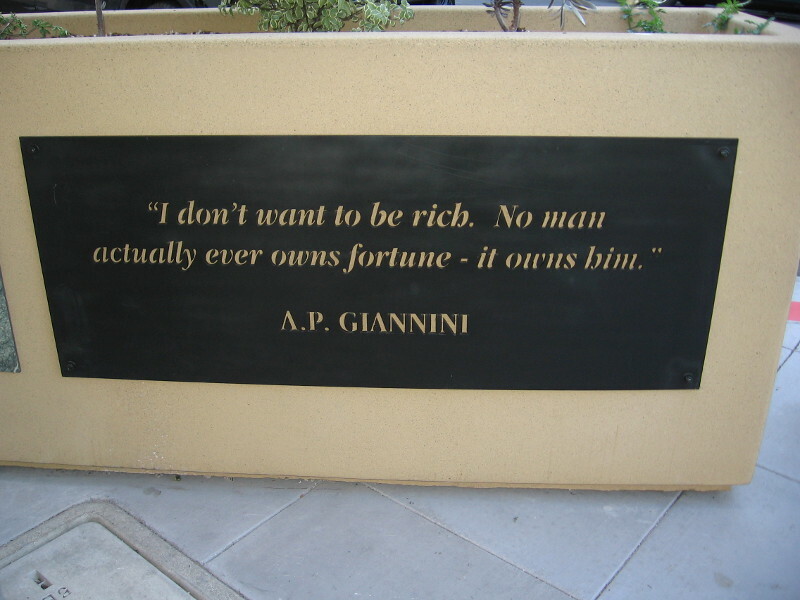 At any given time, about ten percent of his vast collection is on display. I was told that Michael is one of the top half dozen map collectors in the world. 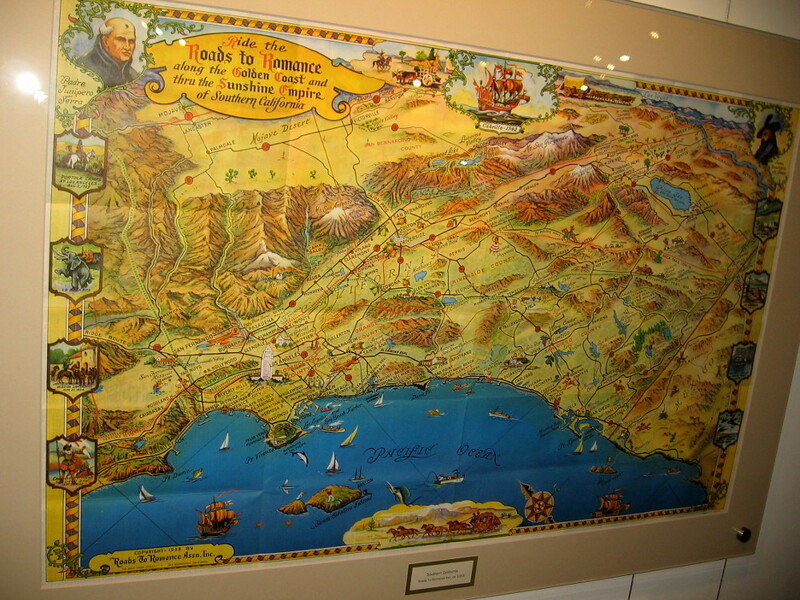 There are antique maps showing Earth as the center of Creation, maps from the Age of Exploration, maps from the Revolutionary War, Victorian maps, tourist maps, even maps showing early San Diego. 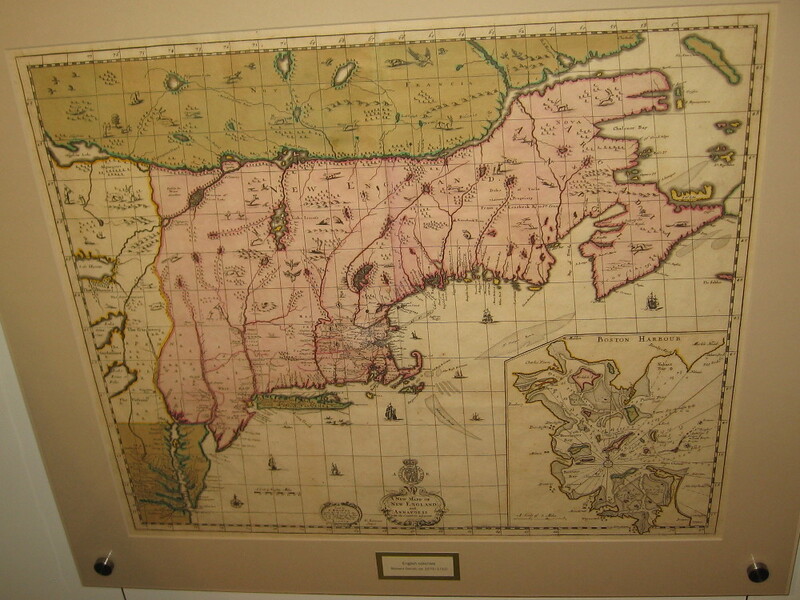 There’s a woodcut map that was created by Benjamin Franklin! 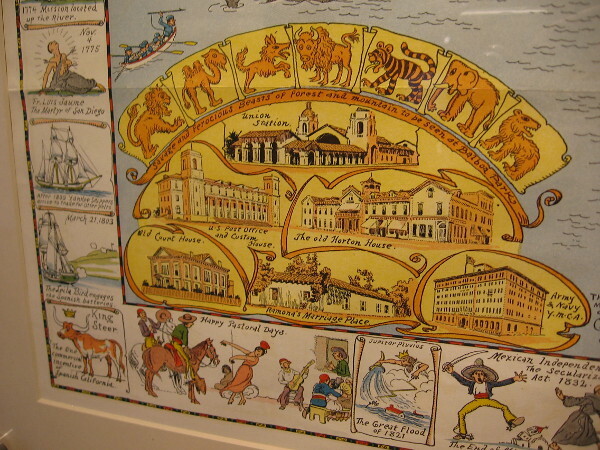 There are artistic maps, humorous maps, playing card maps, practically every variety of map or atlas ever conceived by the human mind. There are also historical instruments used by the old explorers and map makers. 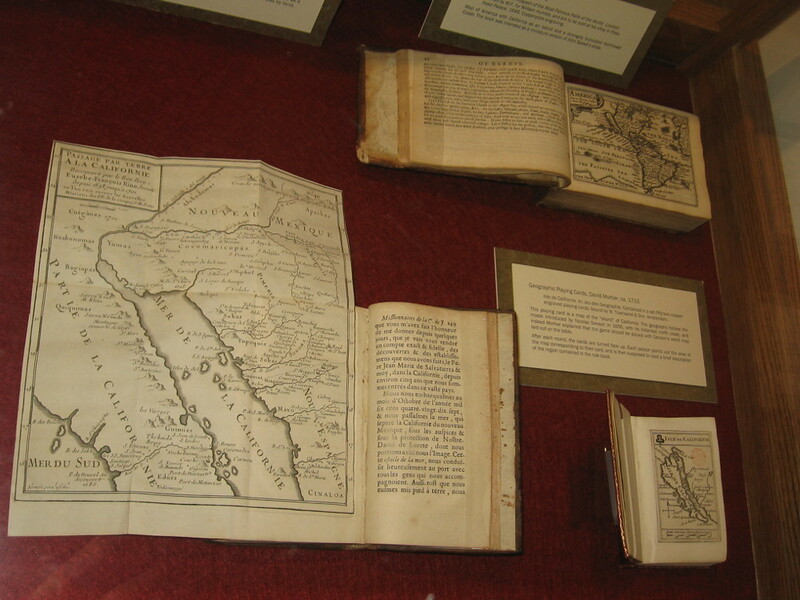 For history lovers, the Map and Atlas Museum of La Jolla is a jaw-dropping delight! Visitors might feel they’ve stepped into the vaults of the Smithsonian or National Archives. The collection is that extraordinary! 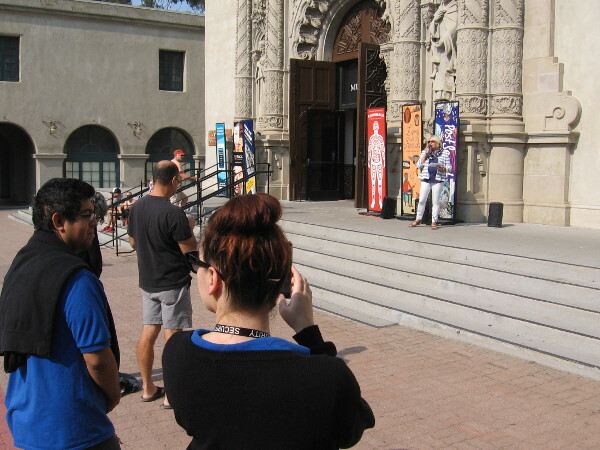 Richard wandered about the museum during my visit, greeting people and providing tidbits of fascinating information. 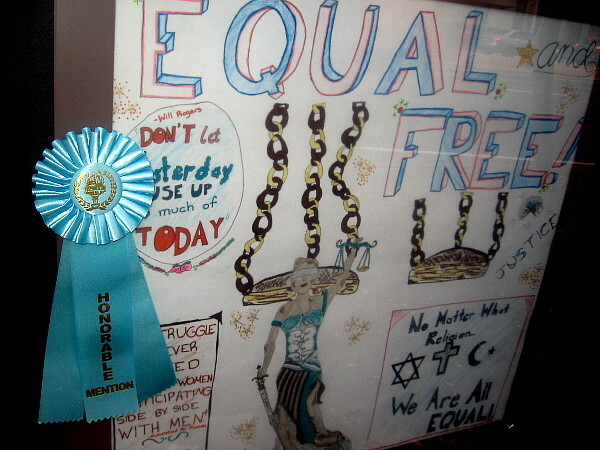 He informed me many students come by the museum, where they can study history, cartography, design and art. The museum contains such an abundance of cool stuff, I don’t know where to possibly begin. 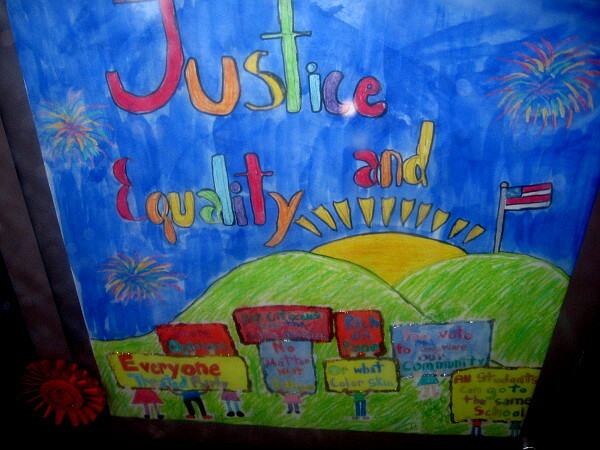 To provide an idea of what you will see, I offer a sampling of photos. I’ve roughly arranged these maps in chronological order. Read the captions! 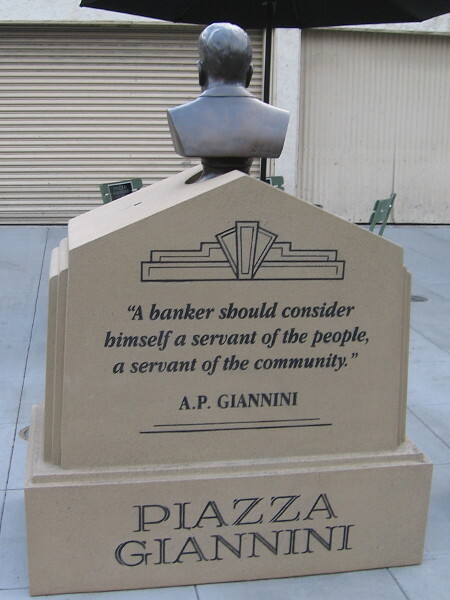 In my opinion, this little-known attraction in San Diego is an absolute must see! 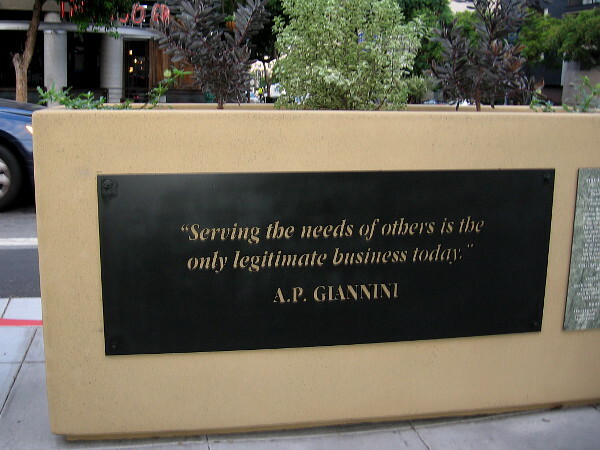 You can find it in the lower courtyard level of the office building at 7825 Fay Avenue in La Jolla. Check out their website for hours and more info, including special exhibitions. 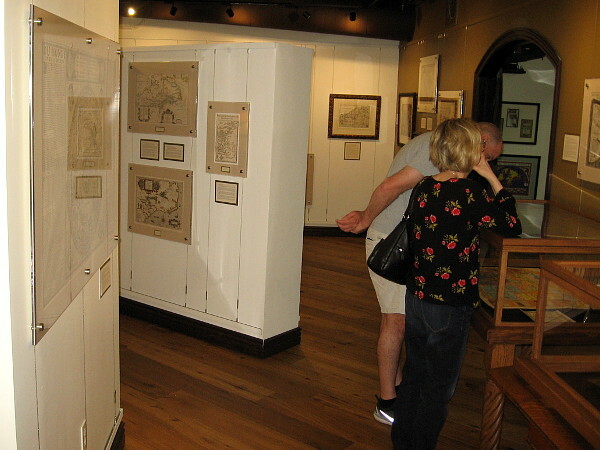 Visitors look at an amazing collection of historic maps at the Map and Atlas Museum of La Jolla. I was shown the museum’s work room, containing a library of books that the public can access. 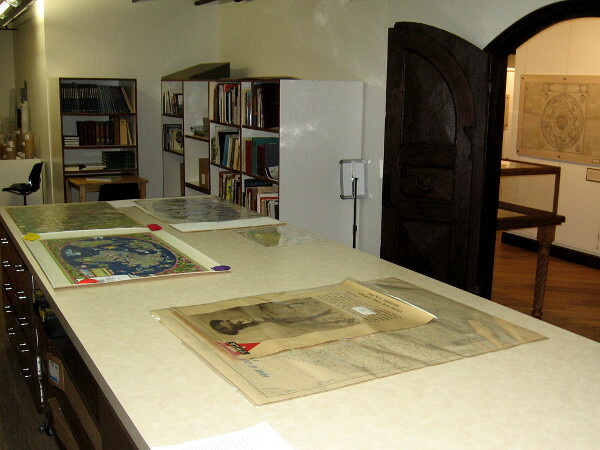 A variety of museum projects like the scanning of maps and historical documents is also done here. The world’s first printed map of a certain date, 1472. 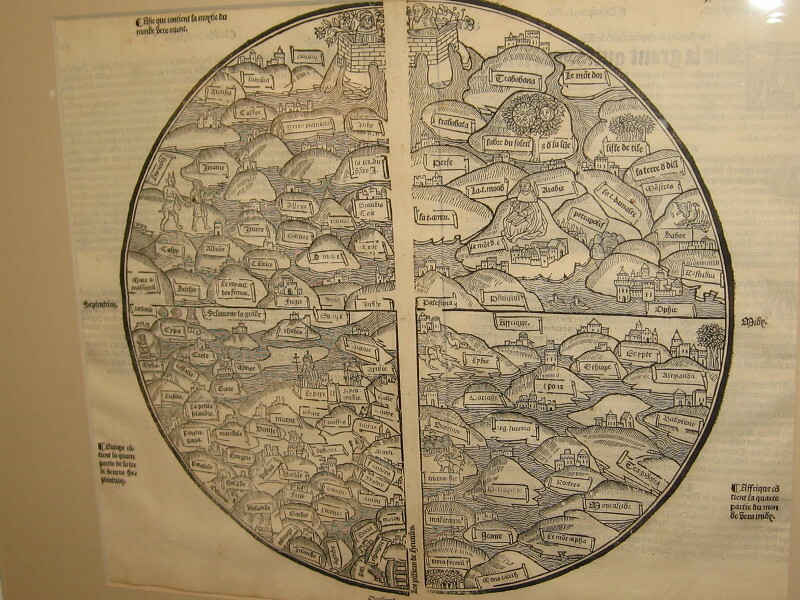 This woodcut T-O shaped world map is from Isidorus Hispalensis (Isidore of Seville). World Map, anonymous, 1491. 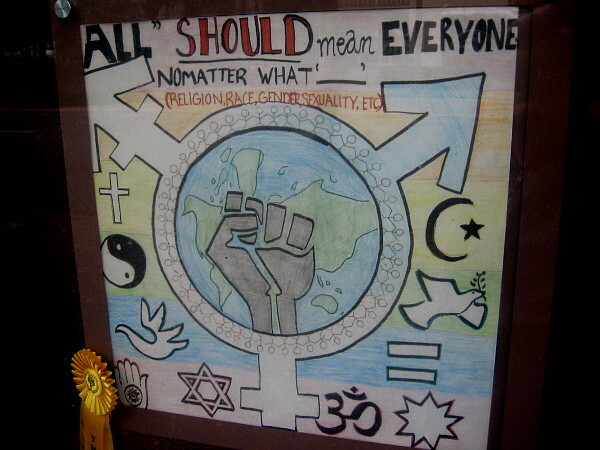 This map was often hung in medieval monasteries or palaces. It first appeared in the Rudimentum Novitiorum of 1475. World Map (Ptolemy), Martin Waldseemuller, 1513. 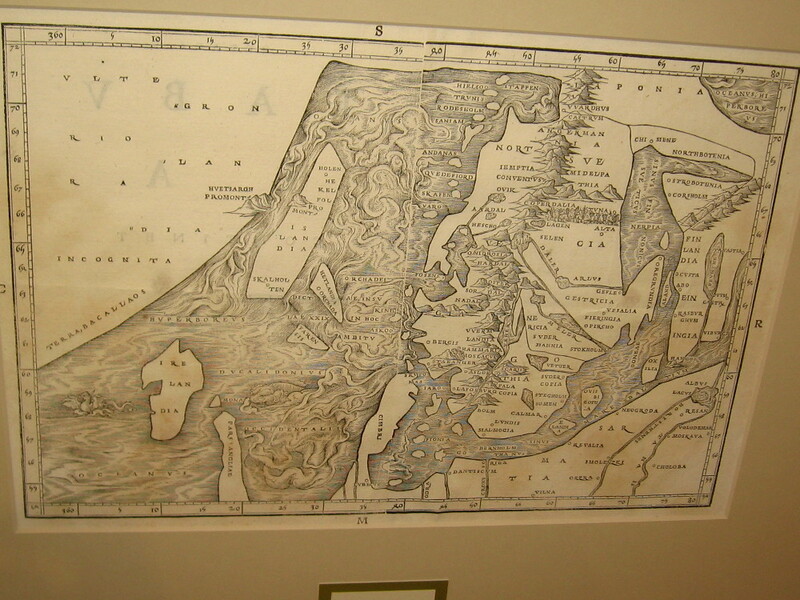 Even after the discovery of America, Ptolemaic maps devoid of a Western Hemisphere were still printed. 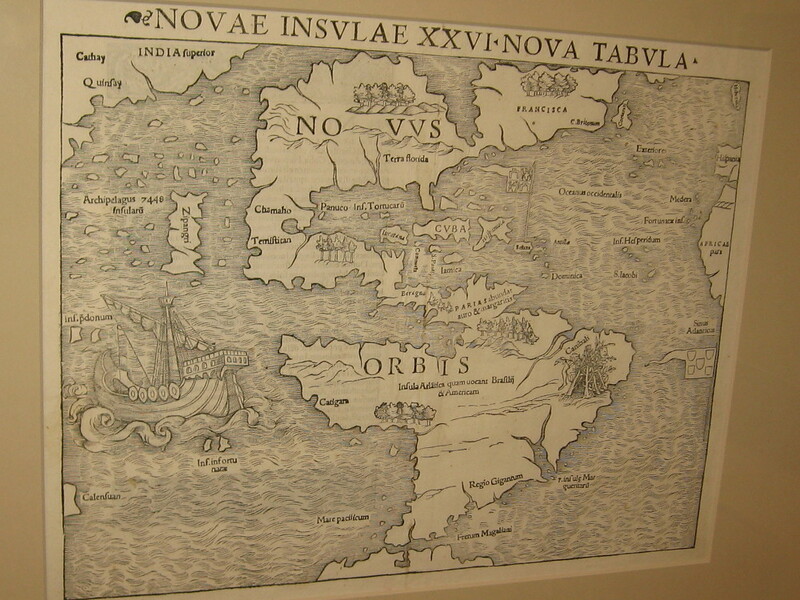 North Atlantic, Jacob Ziegler, 1532. Information for this map was obtained from two Archbishops in Rome. Newfoundland is Terra Bacallaos, or land of codfish. America, Sebastian Munster, Basle, 1540. 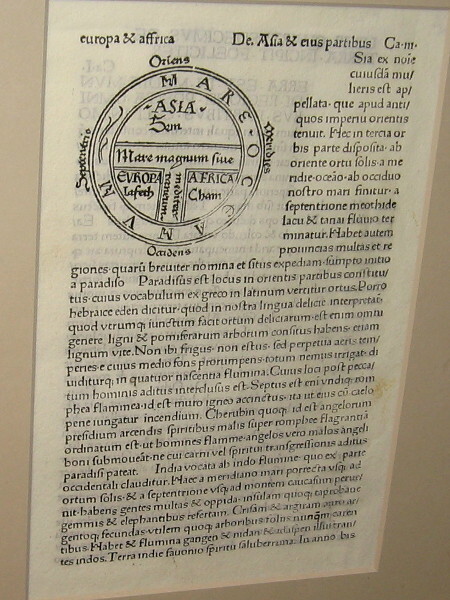 This depiction of North America came from reports by explorer Giovanni da Verrazano. Eastern North America, Girolamo Ruscelli, 1561. 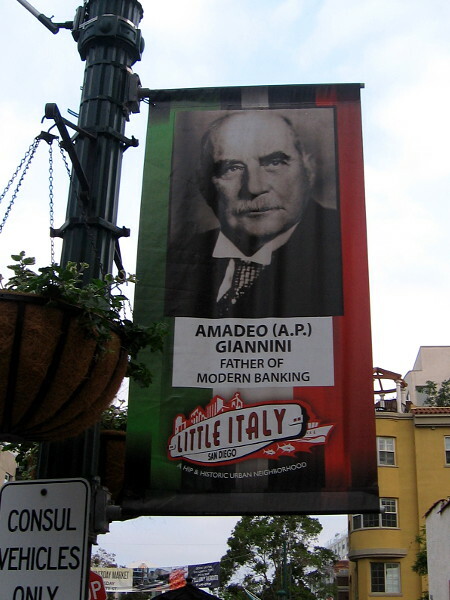 Little was known about the inland geography. 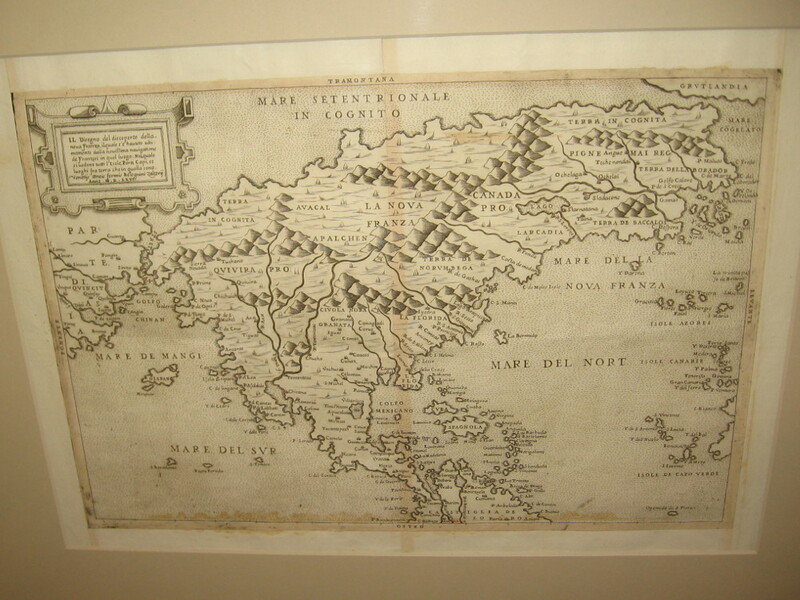 North America, Paolo Forlani, 1565. A map that shows America and Asia separated with a strait. 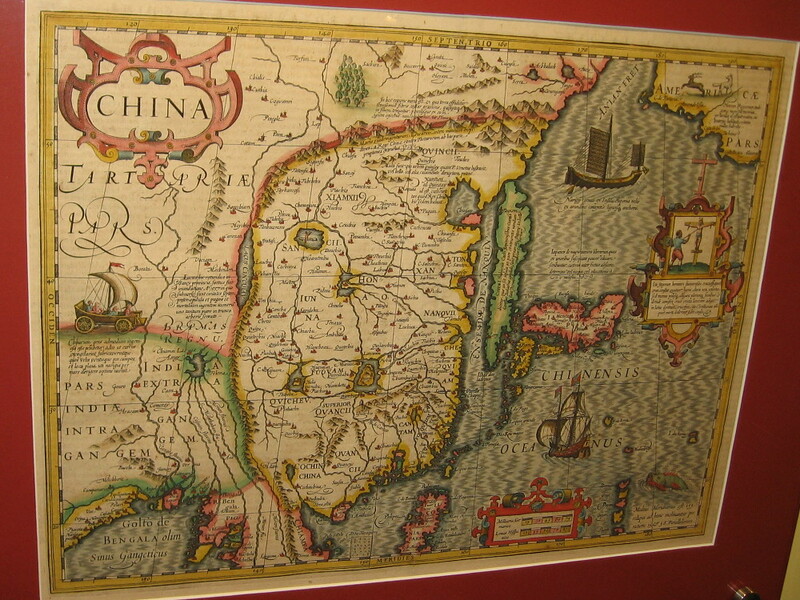 China, Japan and Korea, Jodocus Hondius, 1606. 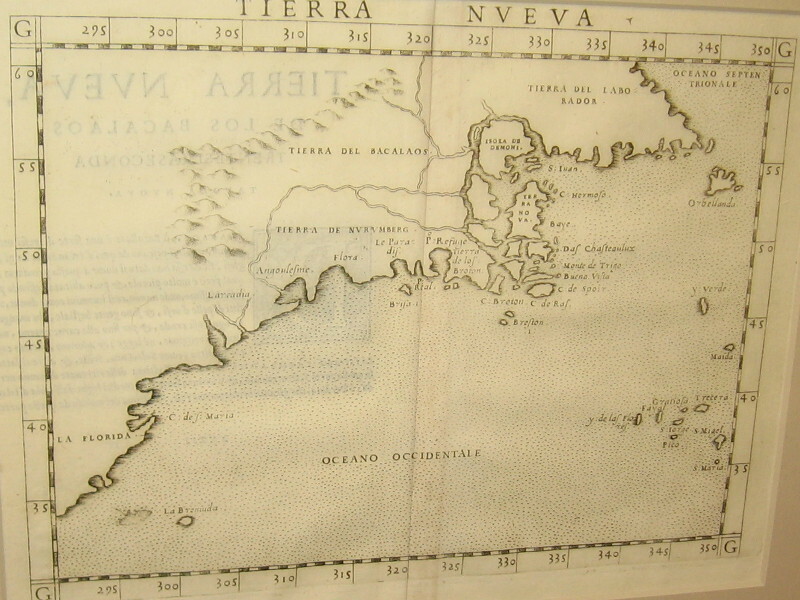 Copperplate engraving from the Mercator Atlas. View of Macao, Theodore de Bry, 1607. 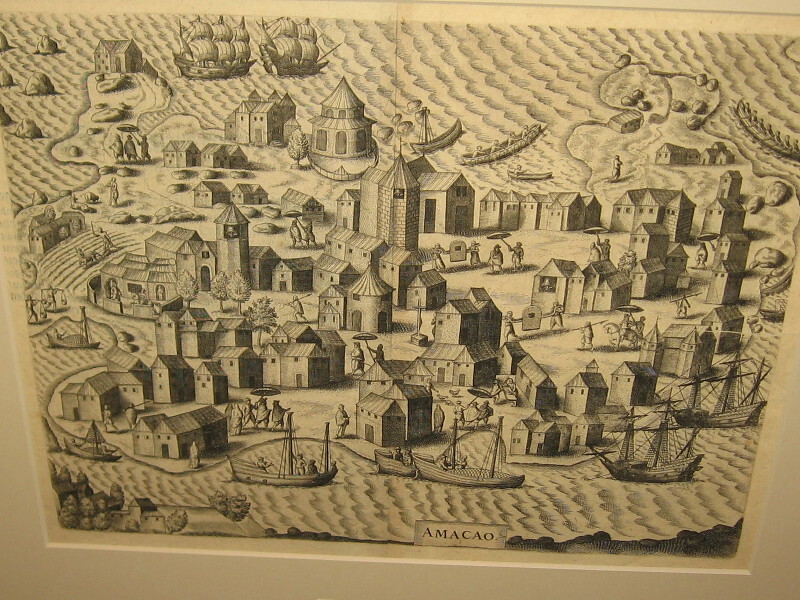 A stylized map, the first published image of Macao. 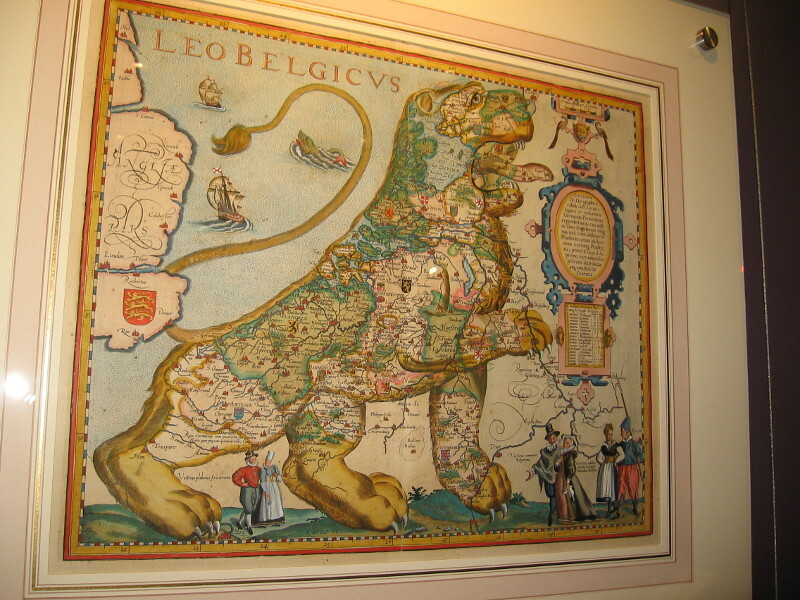 The Low Countries in the Form of a Lion, Petrus Kaerius, 1617. A map of the Netherlands and Belgium. 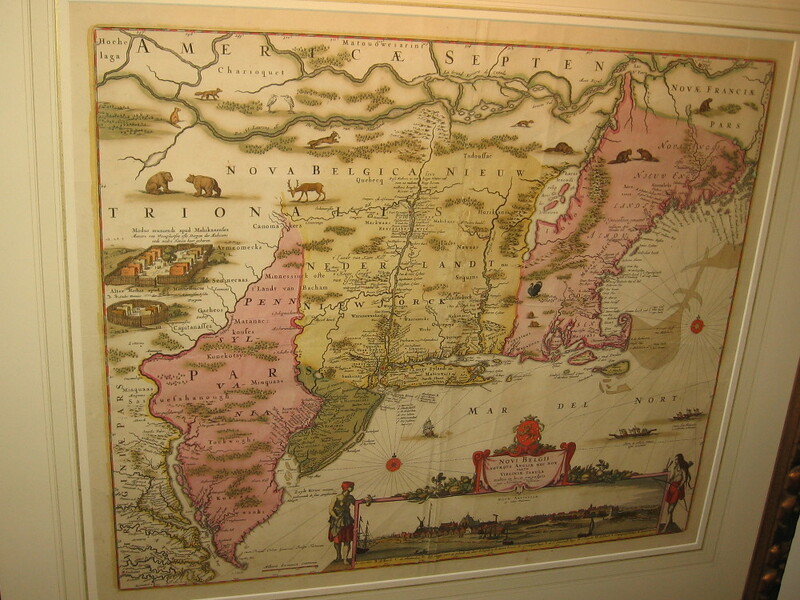 Northeast North America, Jan Jansson and Nicholas Visscher, 1655. 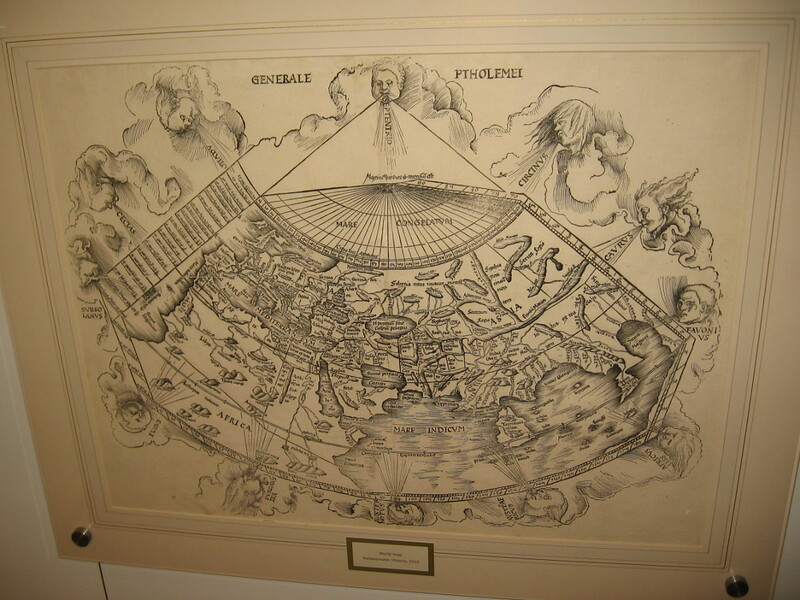 Second Hemisphere with the Christianized firmament, Andreas Cellarius, 1660. 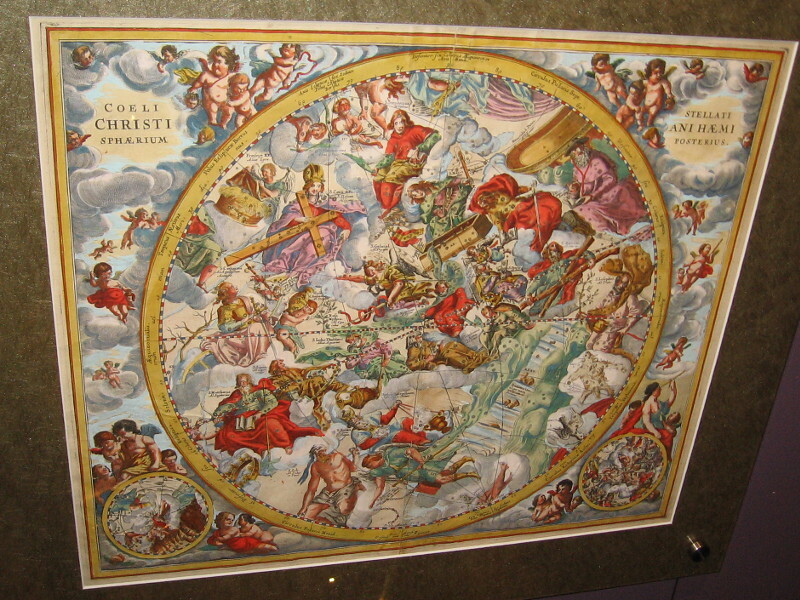 The twelve apostles supplanted the old zodiacal constellations in this map. The Sizes of the Celestial Bodies, Andreas Cellarius, 1660. The heavenly bodies compared with Earth, according to Ptolemy. English colonies, Richard Daniel, ca. 1679. 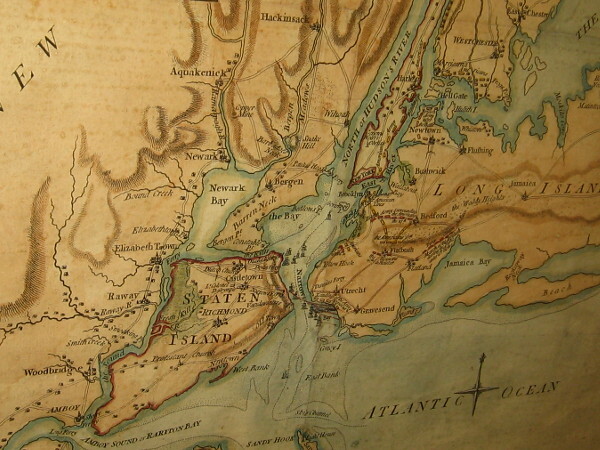 The first printed map of the colonies depicting roads. 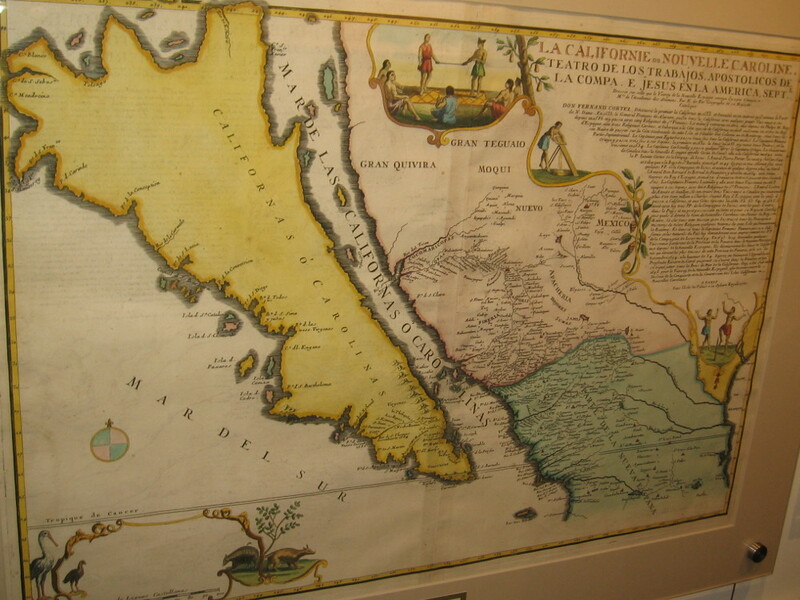 California on early maps was depicted as an island. Southern and Southeast Asia, Frederick de Wit, ca. 1680. A standard Dutch published map. Eastern North America, Hermann Moll, 1715. 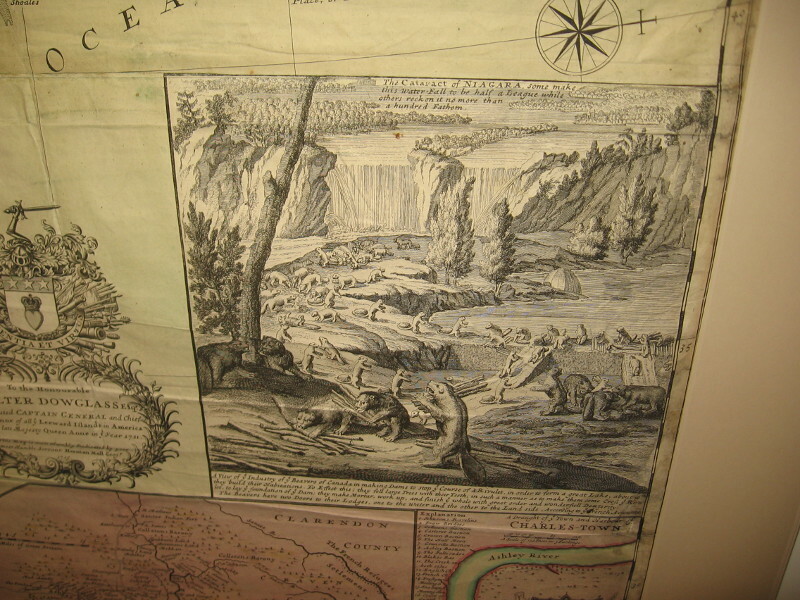 Beautiful illustration on what is commonly called the beaver map, which was copied from an earlier 1698 map by Nicolas de Fer. 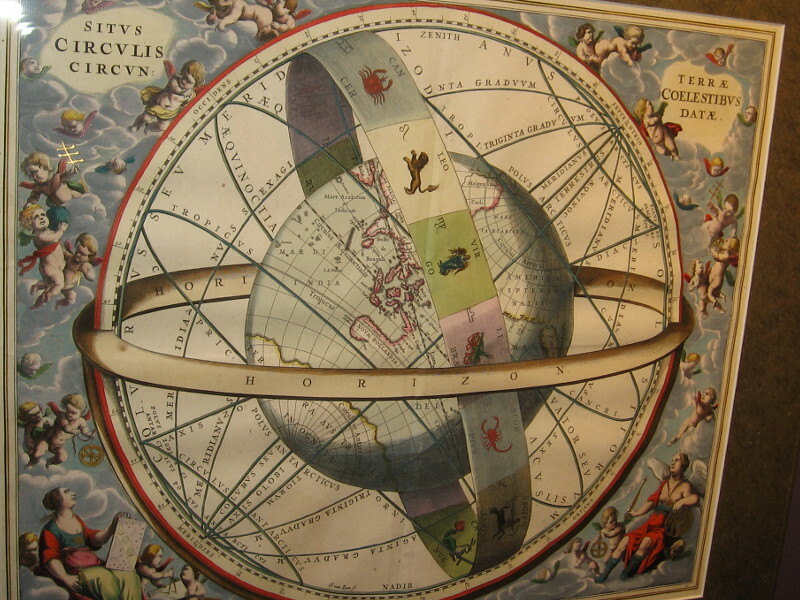 Nova Orbis Terraquei Tabula Accuratissime Delineata, Pieter Van Der Aa, 1713. I love the extensive Latin name given to this highly ornate copper-plate engraving Dutch map! A display case at the Map and Atlas Museum of La Jolla includes geographic playing cards from the early 18th century. 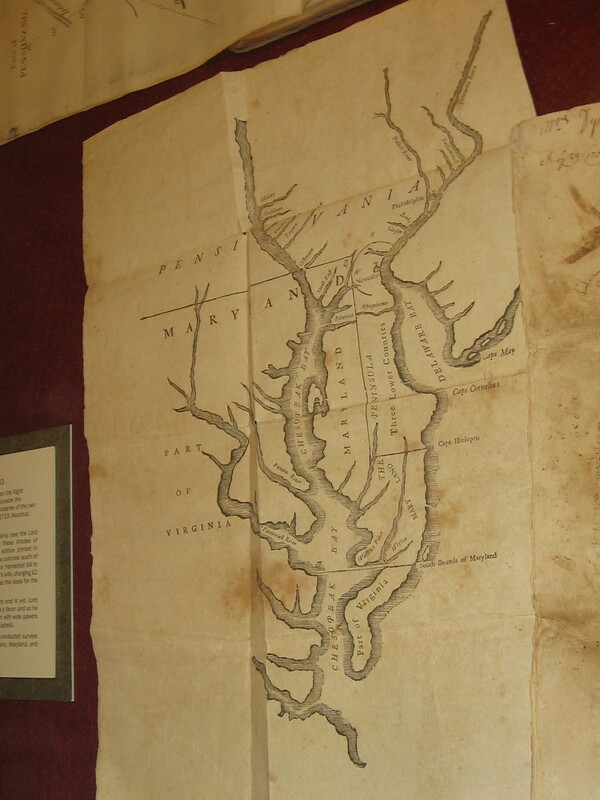 Chesapeake and Delaware Bays, Benjamin Franklin, 1733. Franklin likely cut the woodblock himself. The map shows the newly delineated boundaries of Maryland and Pennsylvania. Battle of Long Island, Samuel Holland, 1776. A section of a map that shows the plan of the first major battle in the American Revolution. New Jersey and Pennsylvania, William Faden, 1777. 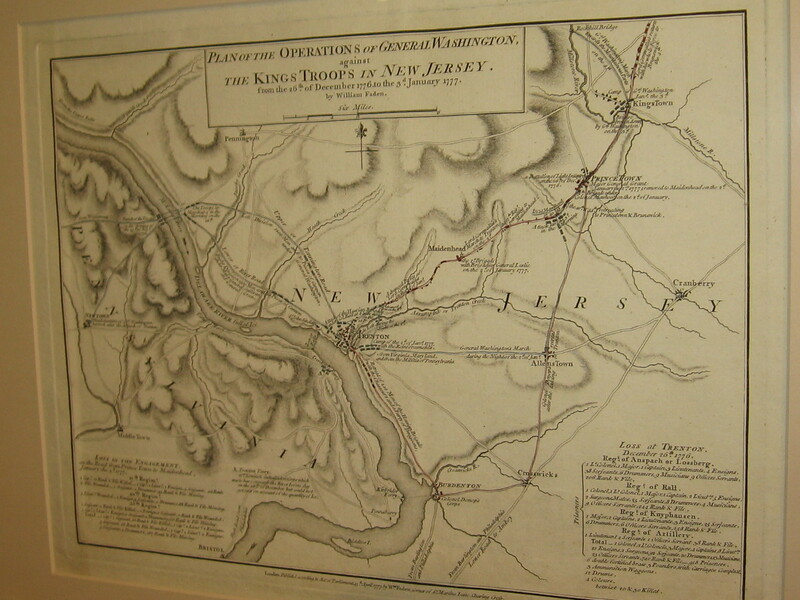 Plan of the Operations of General Washington, against the King’s Troops in New Jersey. Philadelphia, William Faden, 1777. 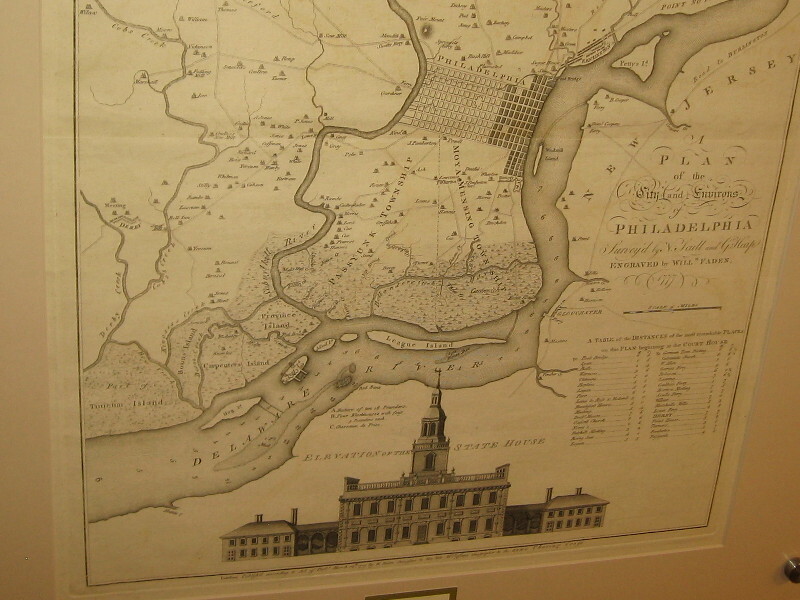 Lower half of the map includes copy of the earliest known printed image of Independence Hall. 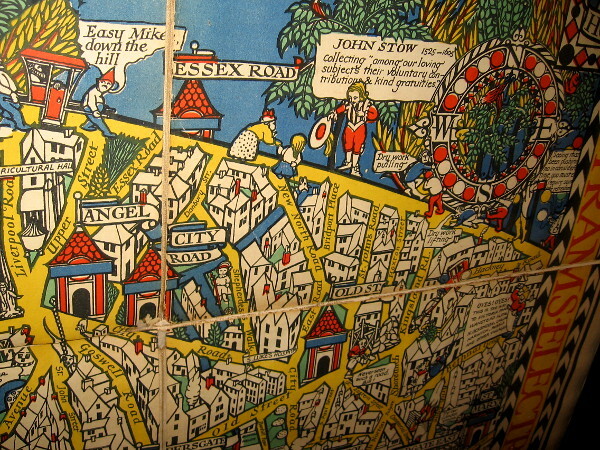 The Wonderground Map of London Town, MacDonald Gill, 1915. 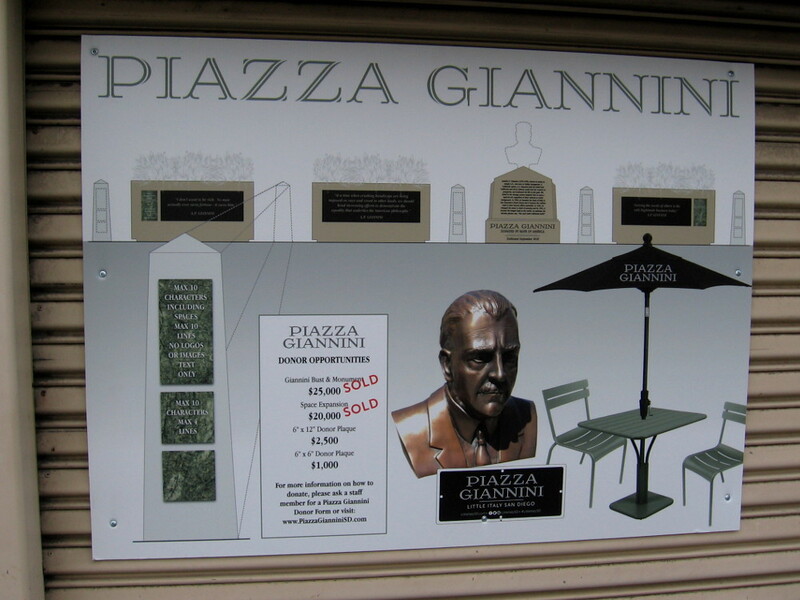 This small section shows some of the delightful retail map’s humor. Mission Beach, San Diego, 1915. Map of the projected development of Mission Beach. 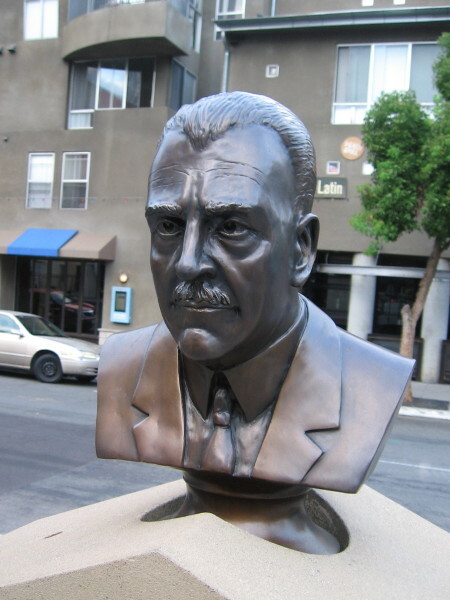 San Diego, Joseph Jacinto Mora, 1928. Corner of a map containing illustrations of local history and important places, like the pictured Union Station (now Santa Fe Depot), Horton House (where the U.S. Grant Hotel stands today), Army and Navy YMCA, and Casa de Estudillo in Old Town, which was then called Ramona’s Marriage Place. 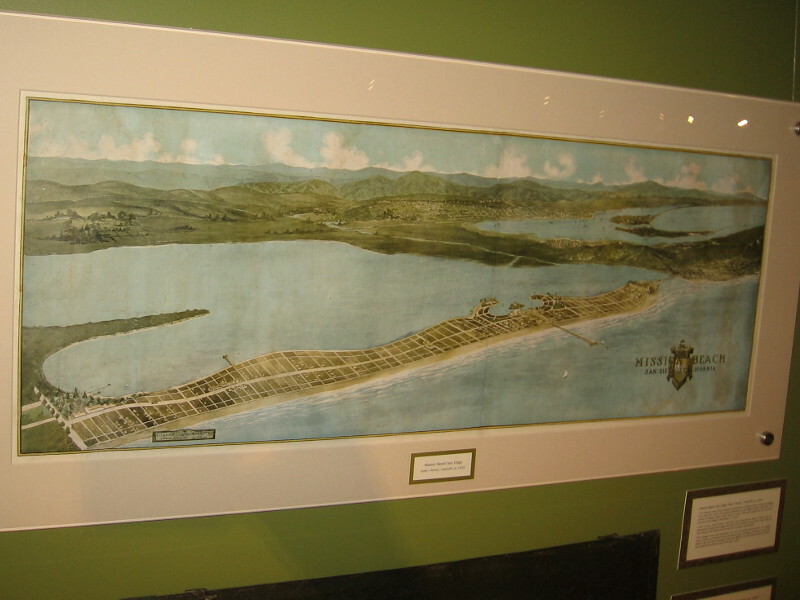 Another section of the same map showing areas around San Diego Bay including downtown, National City, Coronado and Point Loma. 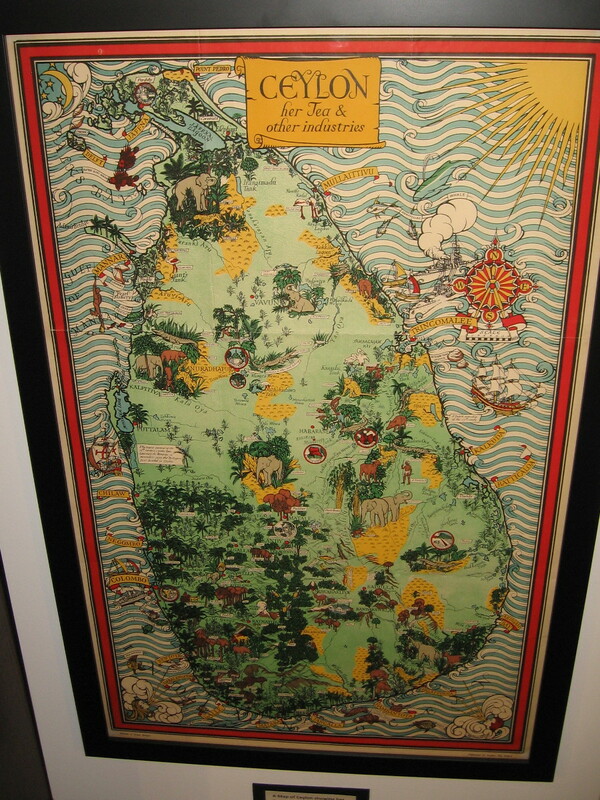 A Map of Ceylon showing her Tea and Other Industries, MacDonald Gill, ca. 1934. 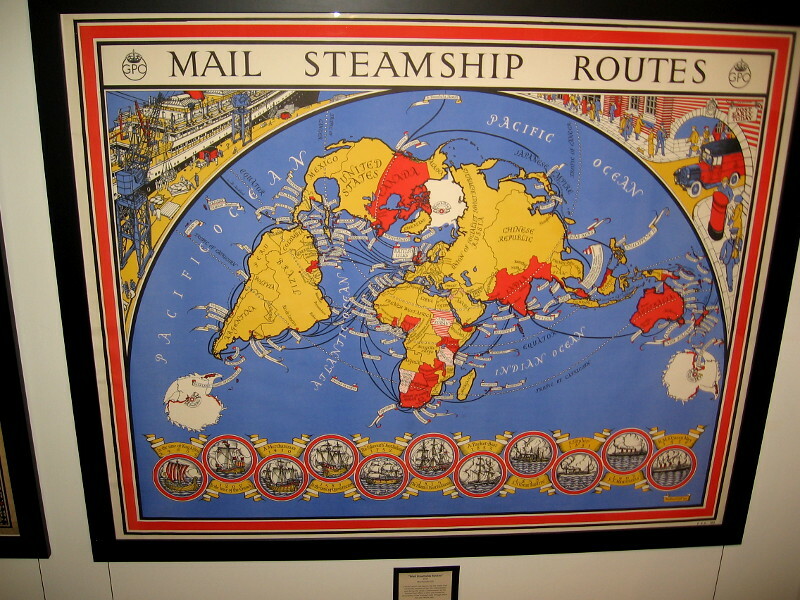 Mail Steamship Routes, MacDonald Gill, 1937. 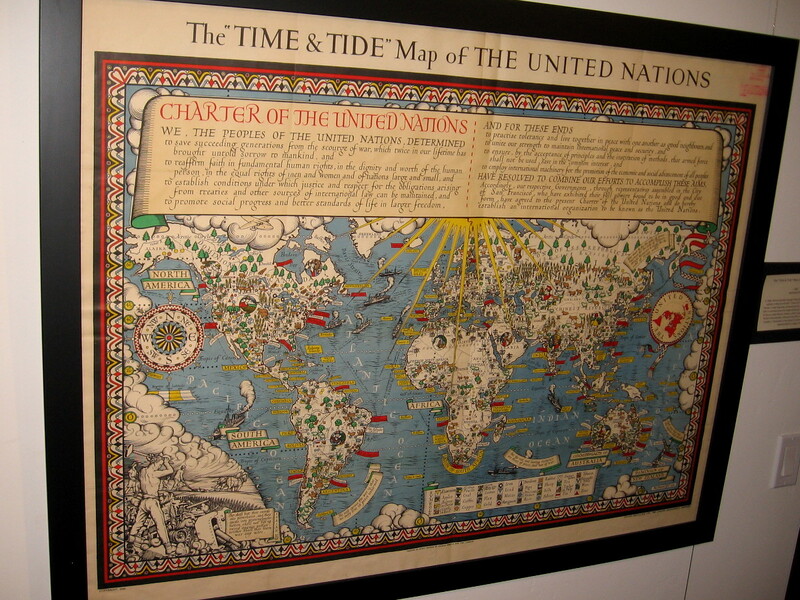 The Time and Tide Map of the United Nations, MacDonald Gill, 1948. 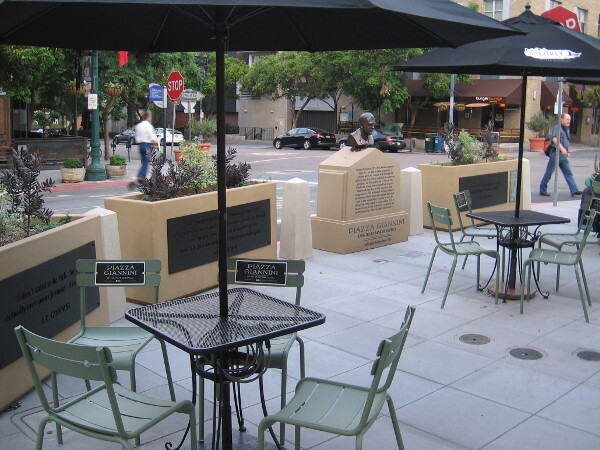 Southern California, Roads To Romance, a tourist map ca. 1958. Thomas Jefferys’ brass theodolite, part of the museum’s collection. Jefferys was geographer to King George III. 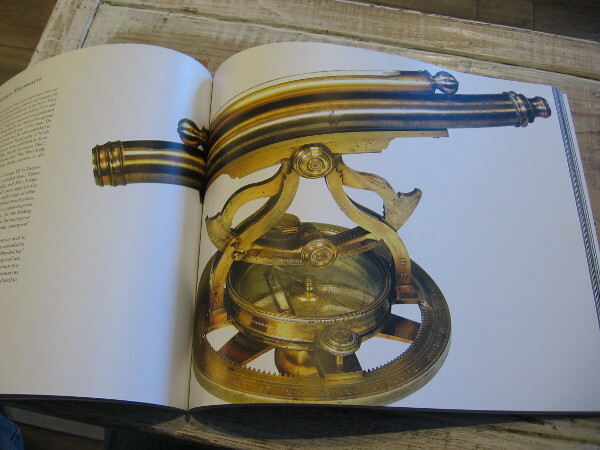 The antique theodolite is pictured in the extraordinary book The Cartographical Collection of Michael R. Stone. 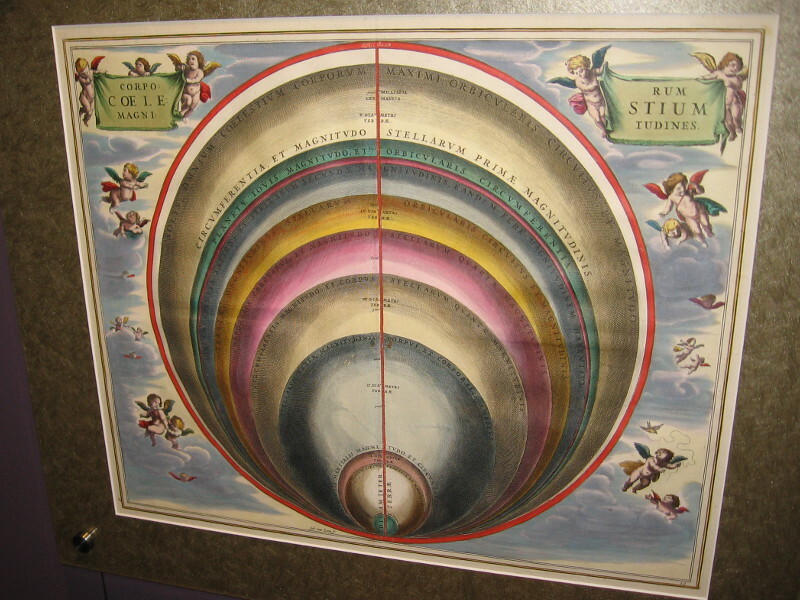 The Location of the Earth, Encircled by the Celestial Circles, Andreas Cellarius, 1660. Posted on April 8, 2018 April 8, 2018 Tags art, california, geography, history, la jolla, libraries, museums, oceans, publishing, revolutionary war, san diego, tourism, travel, united states3 Comments on Visit a world-class map museum in La Jolla!